Another year of Beerchasing concludes and after over seven years, the count of bars, pubs and breweries visited and reviewed logs in at 286 – with 111 of those in the City of Portland or metro area and the remaining 175 ranging from several in Europe to establishments in Alaska, Hawaii, various regions of the US and all across and down the coast of our wonderful state of Oregon. 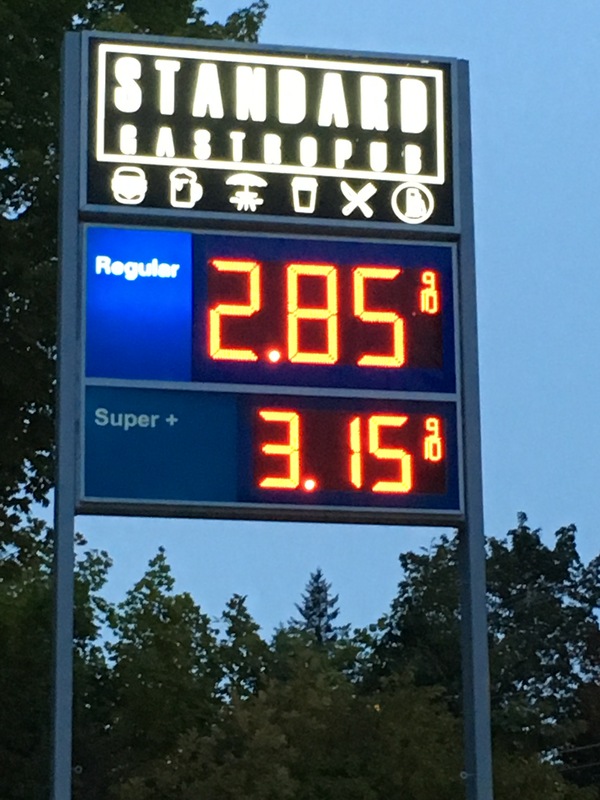 Indeed, our retirement travel has expanded the scope of this retirement hobby, which I originally intended to be confined to those in Portland. The chart below was done after an intensive audit of all my posts during the last 7+ years – because when it comes to watering holes – accuracy is important…..
As has been the case each year, the number of views and visitors to Thebeerchaser.com has increased. And I beg your indulgence in spouting a few of these statistics – possibly because the habit was ingrained by reviewing the “always stimulating” management and productivity reports produced at a large law firm – Schwabe Williamson & Wyatt – one I was proud to call my work home for twenty-five years. This year there were over 25,340 views of posts by 18,190 visitors – exceeding the record last year of 24,577 and 18,623. And I still am surprised at where these visitors view the posts with 86% from the US and another 6% generated collectively from India, Canada, the United Kingdom and Germany. The remaining 8% were people from 128 different countries, many of whom I suspect, Googled the term “Beerchaser” and were probably looking for something different than my bar tour. As usual, this hobby has been educational for me and 2018 was no exception. 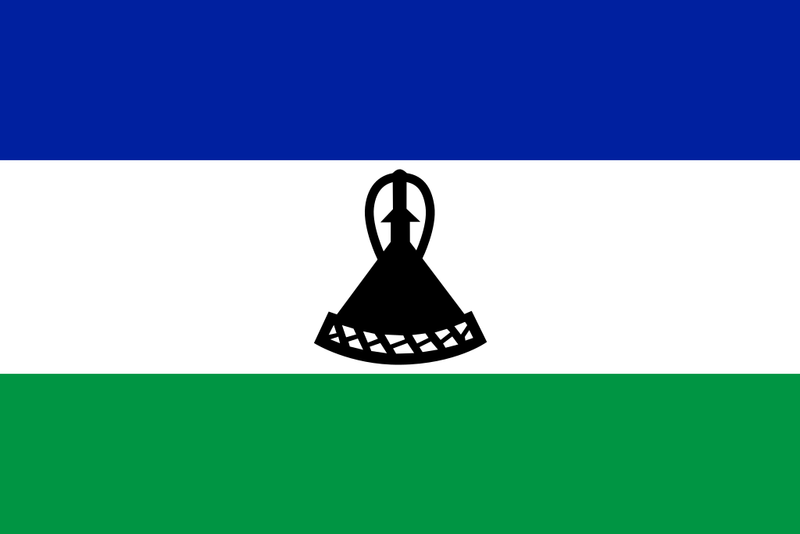 For example, it took some research to locate where the one view I got from Lesotho emanated – It’s an enclaved country of two million within the border of South Africa. 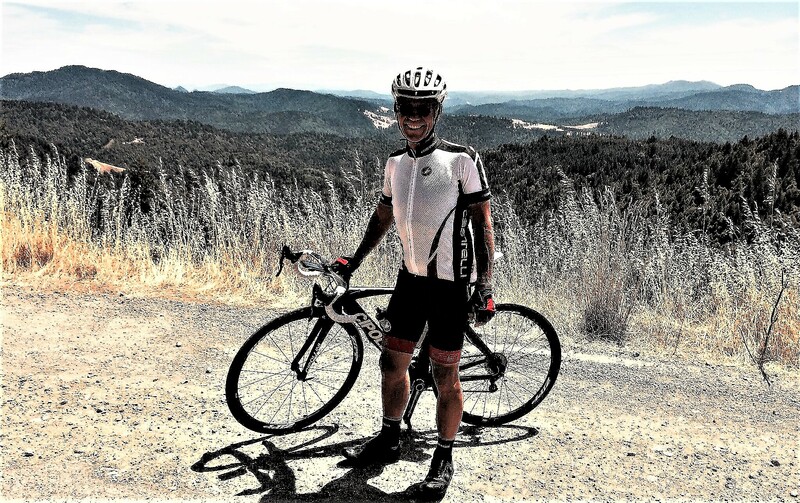 Note: Now it does not surprise me, but after publishing this post I got a comment from Jay Waldron, Schwabe partner and Beerchaser-of-the-Quarter (March 29, 2016) that he had ridden his motorcycle through Lesotho when he cycled through South Africa. Click on the link above to read about more of his exploits. 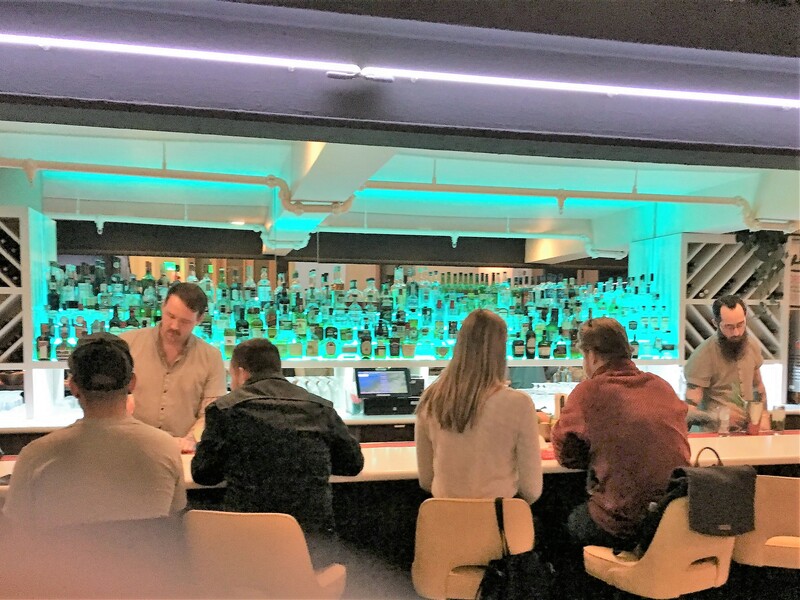 As you might have noticed from the chart at the beginning of the post, the number of Portland bars at twelve, was one of the lowest counts since this blog was launched in 2011. 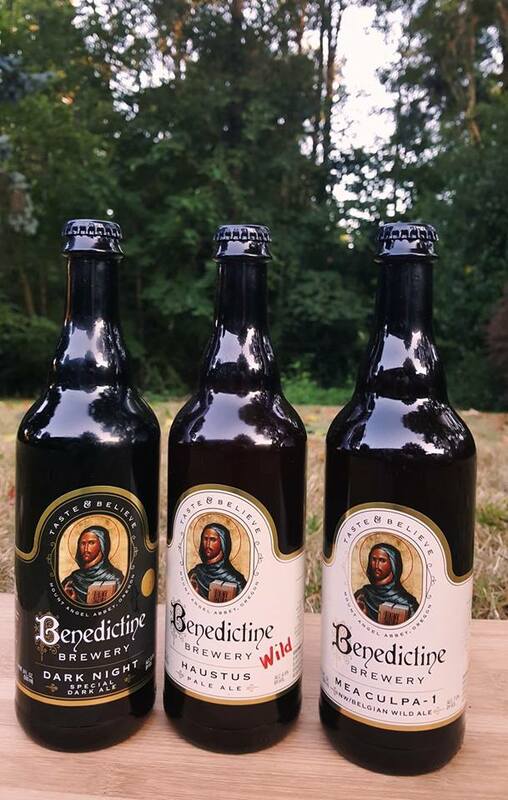 This was because we traveled more and I had extensive involvement as a volunteer in the development of the Benedictine Brewery at the Mount Angel Abbey. I’m proud to say that we opened the Brewery and the St. Michael Taproom in September and so far, it has been a great success. 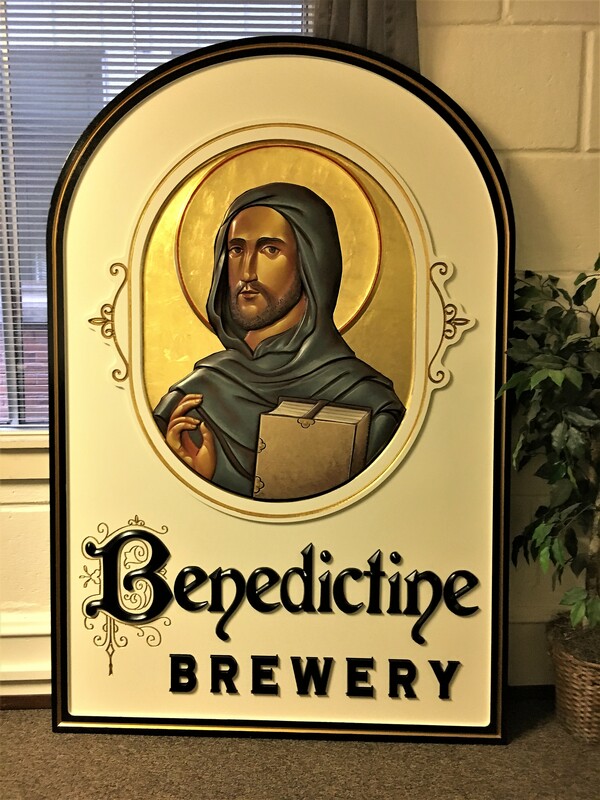 It’s one of three breweries owned and operated by monks in the US and came to fruition after six years of planning, fundraising and construction. 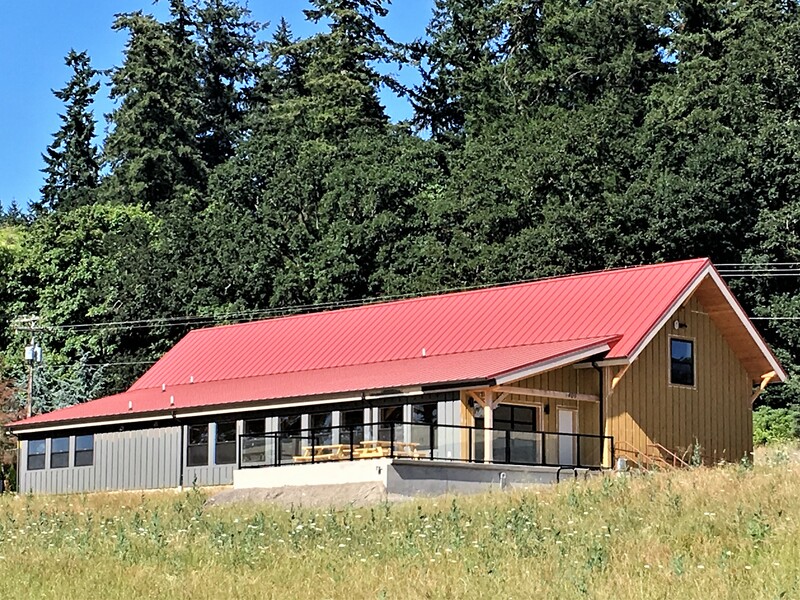 You should plan to visit the Taproom in 2019. While the number visited and reviewed was somewhat meager at only twelve, I Beerchased at some distinctive bars and pubs this year ranging from the classic NE Portland dive bar – The Standard to the upscale cocktail bar – Palomar – named Bar-of-the-Year by Oregon Live to a new and wonderful neighborhood pub not to far from my home in West Linn – The Salty Rhino. 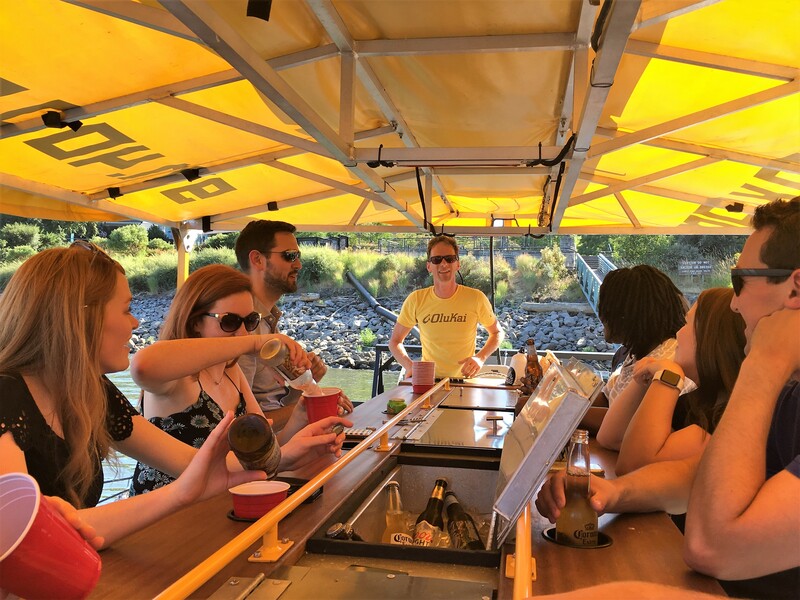 Captain Eric (yellow shirt) skipper of the Brew Barge shirt) briefs his crew..
And there was the cruise on the Portland Brew Barge with my former Schwabe colleagues in August. 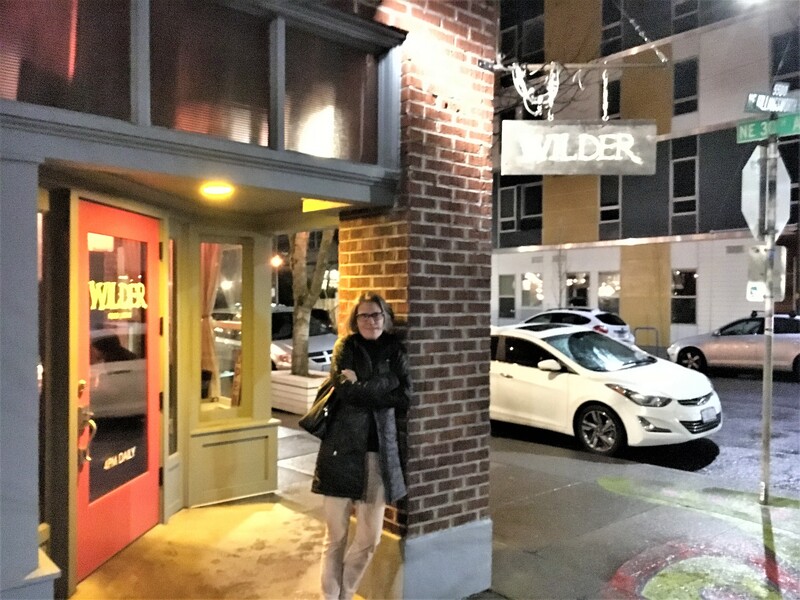 We also paid our first visit to what has become our new favorite place to eat and have a brewski or cocktail – Wilder Bar/Cafe in Northeast Portland. 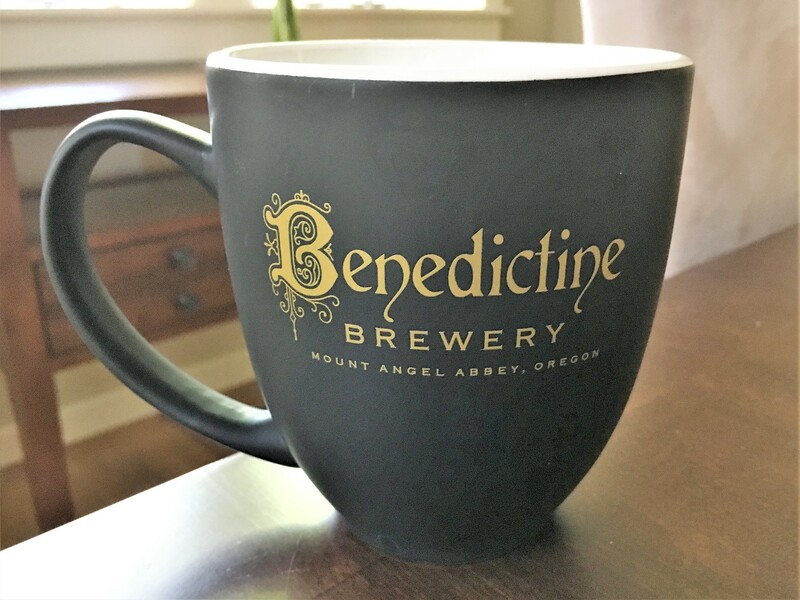 I included the Benedictine Brewery in Mt. Angel in the Portland area as everybody in the Rose City should make this short trip. Of course, there were a couple misses – venues to which I would not return. These included the Happy Fortune and Bar 33 – Brooklyn. 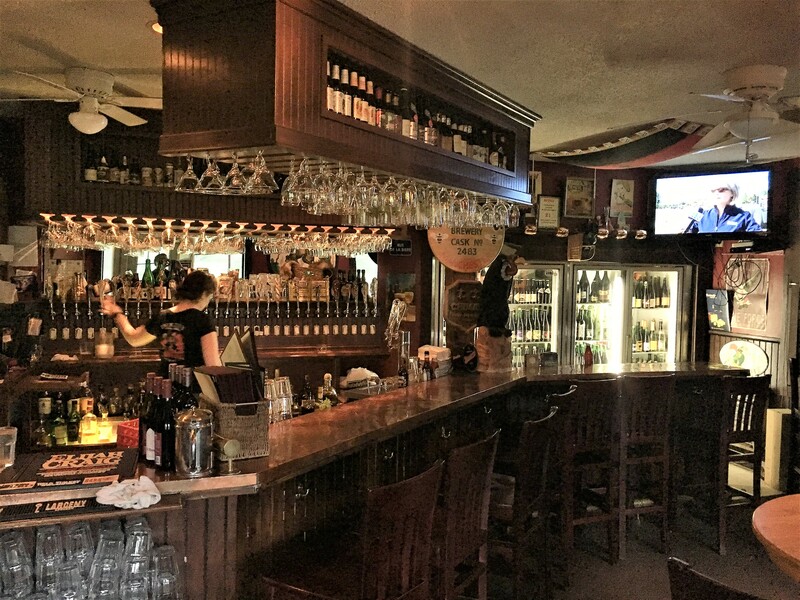 Read the reviews to determine why Thebeerchaser – who by his own admission – loves almost all saloons and pubs, thought these were not worth your time. 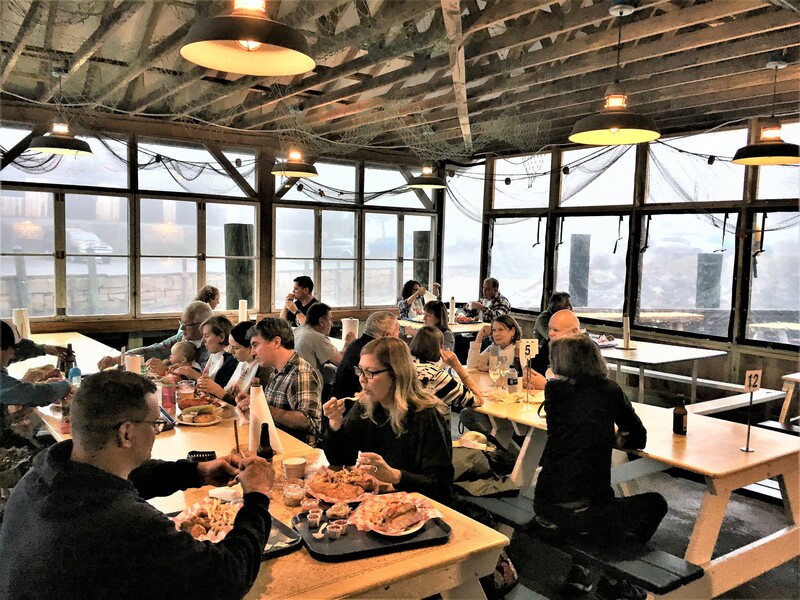 * After seven years, The Woodsman Tavern has now closed and a new site for popular restaurant Tasty N Sons will open in the same quarters. We traveled to Arizona for a week in the spring and while Phoenix/Scottsdale is definitely not our favorite urban spot in the US, there were some great breweries and hikes to make it a good trip. 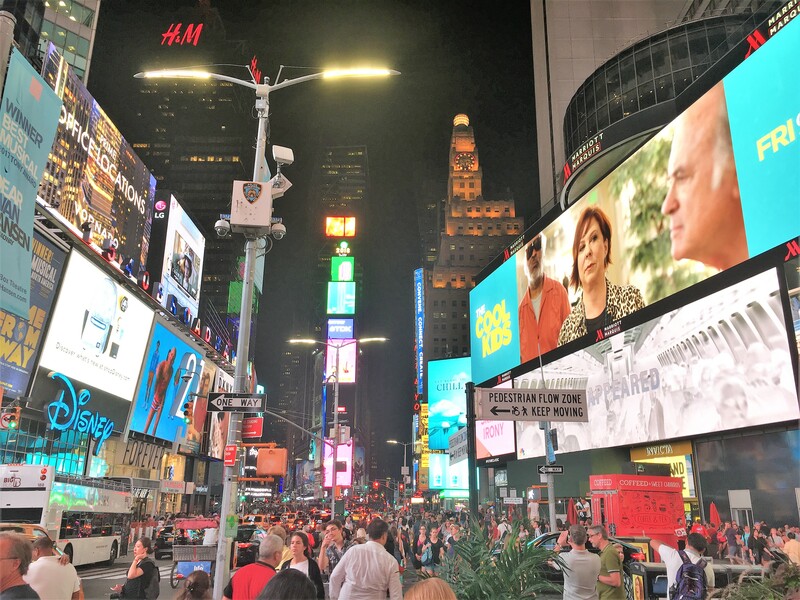 The highlight of our travel in 2018, however, was an eleven day trip to New York City, Maine and Boston. 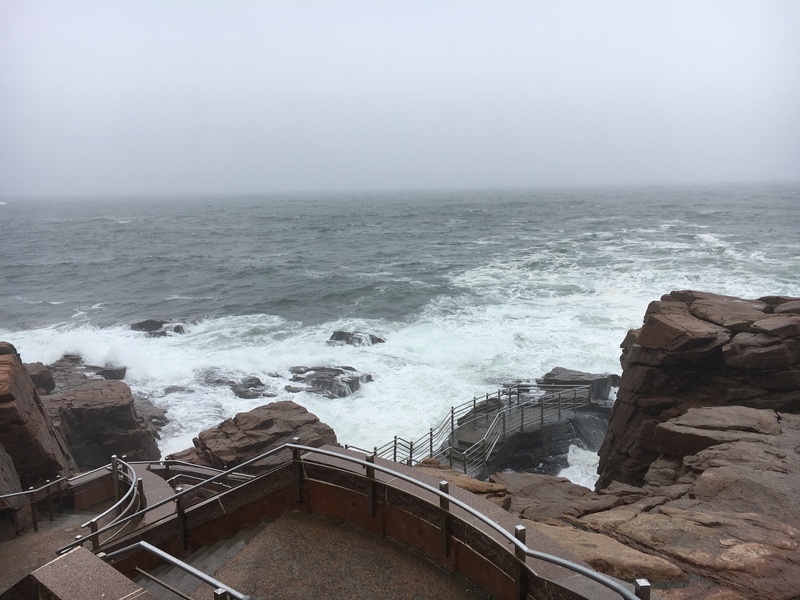 While we love the Northwest, the frenetic and diverse culture of Manhattan; the scenery, including Acadia National Park; the micro-breweries in Maine (ranking third in breweries per capita in the US) and a night in the North End of Boston, made it a vacation to remember. Overall, we visited thirty bars, pubs and breweries on these two trips. I prefer to assert that the gravitas of the two 2018 BOQs is expansive enough to justify naming only two. 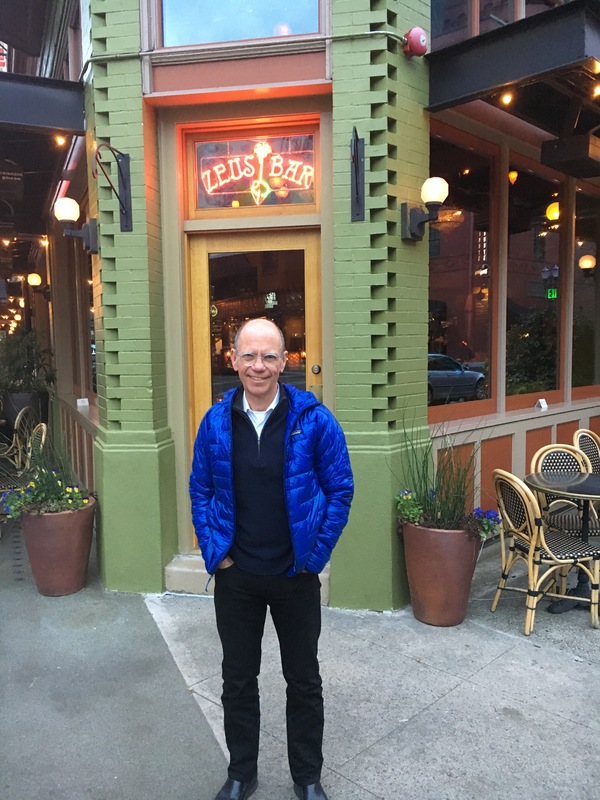 Portland developer, environmentalist, outdoorsman and civic icon, Mark Edlen, was named in February and it was a pleasure re-engaging with Mark, who I originally met in 1979. Our law firm was also the beneficiary of his real estate expertise when he served as our commercial realtor for a number of years at Schwabe before he formed Gerding Edlen Development Co. in 1996. And I could also maintain with some accuracy, that the second BOQ – the 1967 Oregon State Giant Killer Football Team and it’s de-facto historian, Jud Blakely, if considered as individuals rather than as a group, would garner this designation for a number of years. 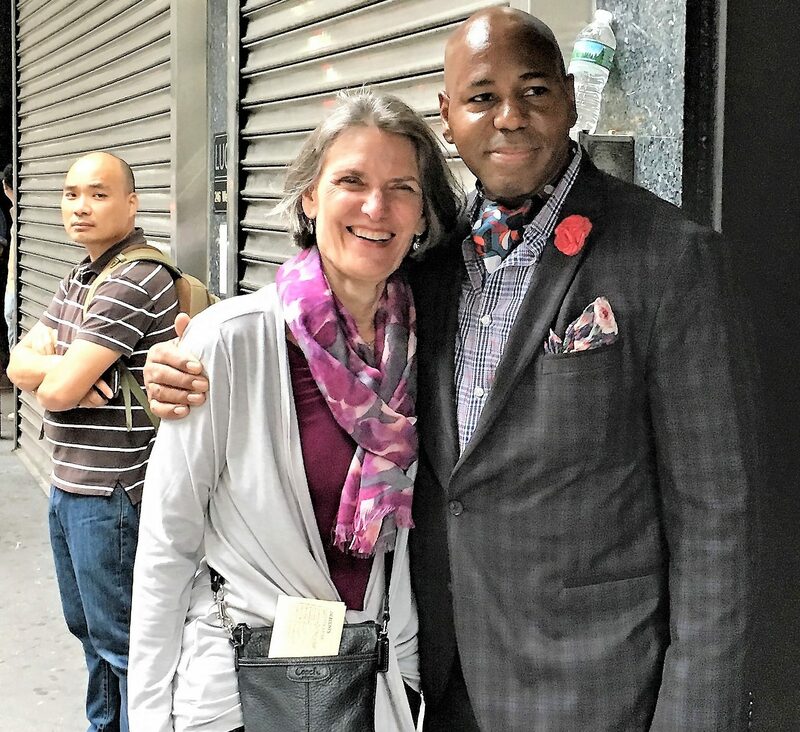 Jud, who is an SAE fraternity brother and has been a friend for over fifty years, was one of the early BOQs (September, 2013) based on his remarkable persona and achievements. Any OSU alum, or for that matter, any Oregonian interested in one of the great historic athletic tales of the State of Oregon, should visit the website below for the complete story. It’s a labor of love by this OSU alum and former OSU Student Body President and I consider it the War and Peace equivalent to sports websites. 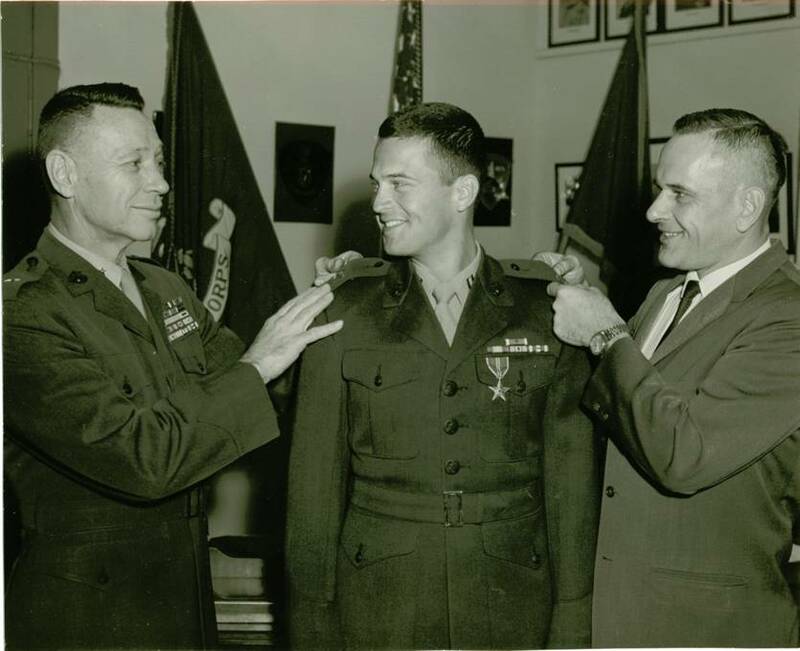 Blakely receiving his Bronze Star and promotion to captain from the Asst. Comandant of the Marine Corps. Indeed, the story of the Giant Killers is so compelling, that it will require subsequent Beerchaser posts to complete the story of this unique team and the outstanding individuals. 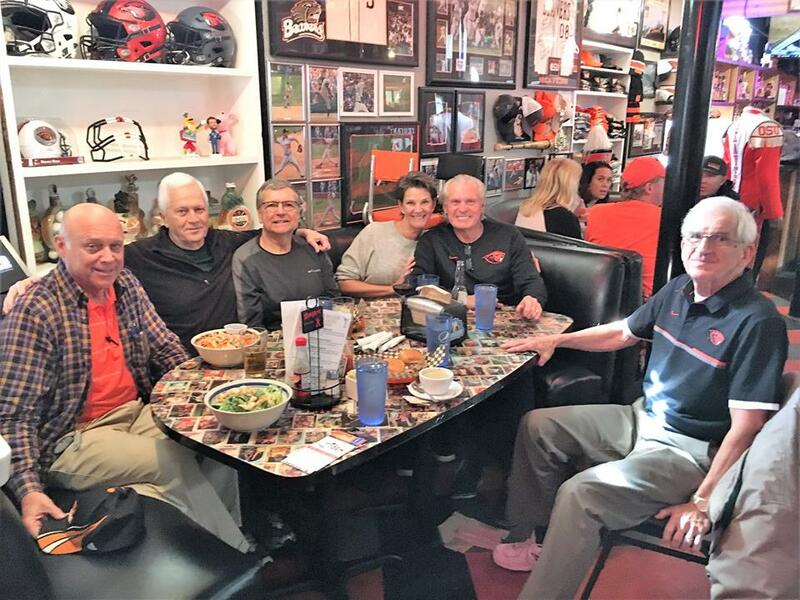 And it was incredibly rewarding to interview or reconnect with some of my long-term friends who were either on the team or associated with the Giant Killer Era including Larry Rich, Craig Hanneman, Chris Wahle, Gary and Duane Barton and Scott Spiegelberg (played football after the Giant Killers and is now Director of OSU Varsity and Alumni Engagement) – but also to meet a number who I didn’t know until researching for the blog post. Fear not for I have already identified my next two Beerchasers-of-the-Quarter and will get back on track with some very interesting people in 2019. 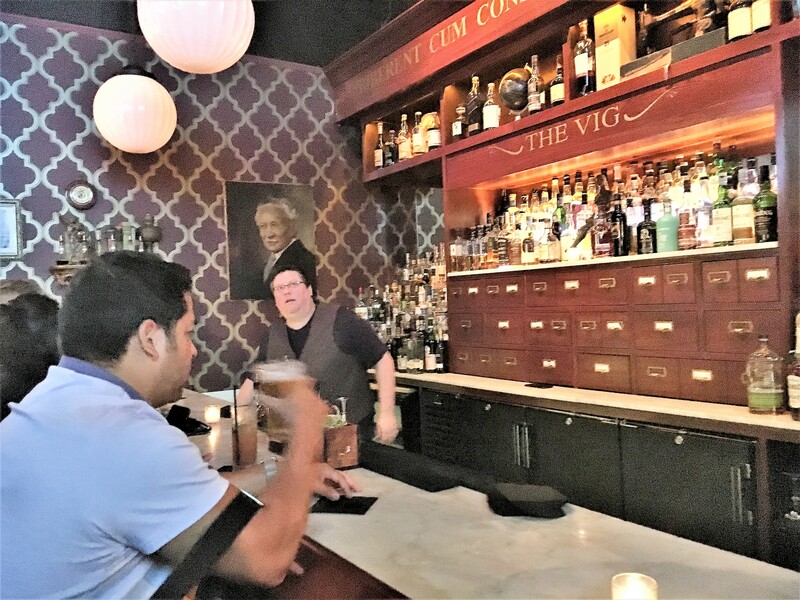 Similarly, since I have already visited, but not made a customary second visit and/or written the reviews of another ten Portland area bars and two from a trip to Palm Springs, Thebeerchaser will have no shortage of watering hole stories to relate. If you have a bar, pub or brewery that deserves inclusion, please let me know. 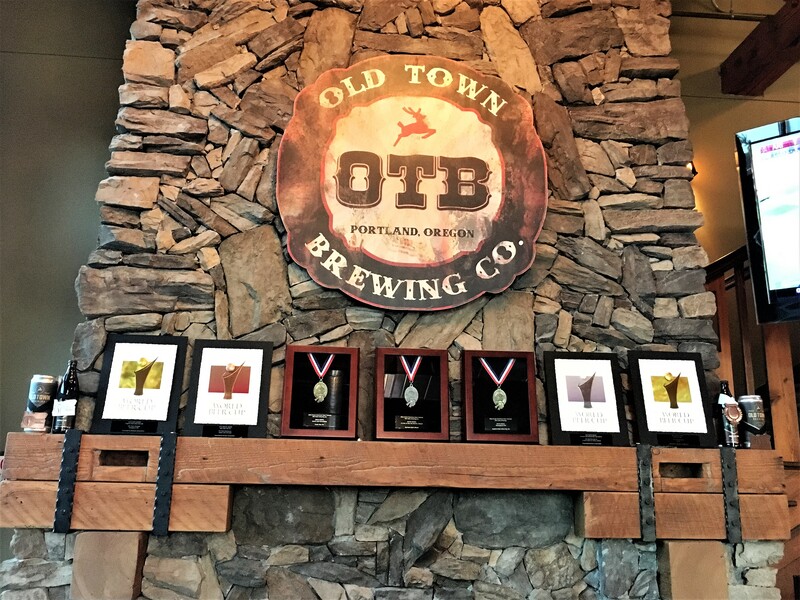 Stay tuned in 2019 for the fascinating story of Portland’s Old Town Brewing…..
And in January, I will also publish the complete (and audited) list of each establishment visited from 2011 to 2018 including the location and the date of TheBeerchaser post for those who want this data base as a resource. 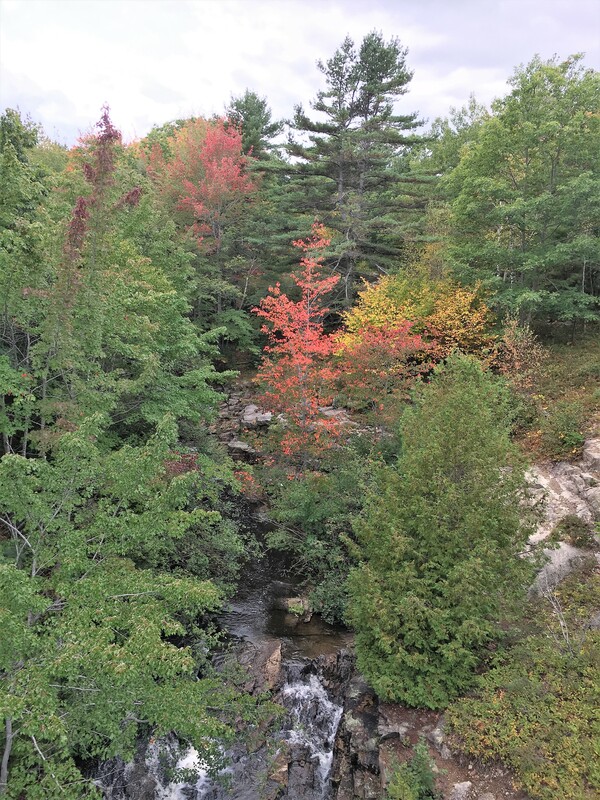 I might even decide to identify a number of my favorite habitats of different types e.g. 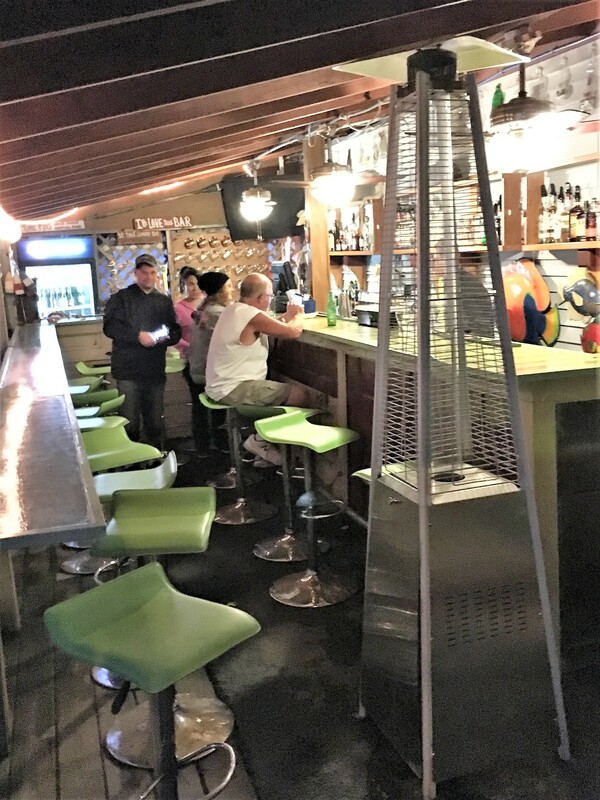 dive bar, neighborhood, sports, cocktail lounge, etc. during this journey as well as pointing out the few that I would recommend you pass by as they would not enhance your Beerchasing experience in my humble opinion. 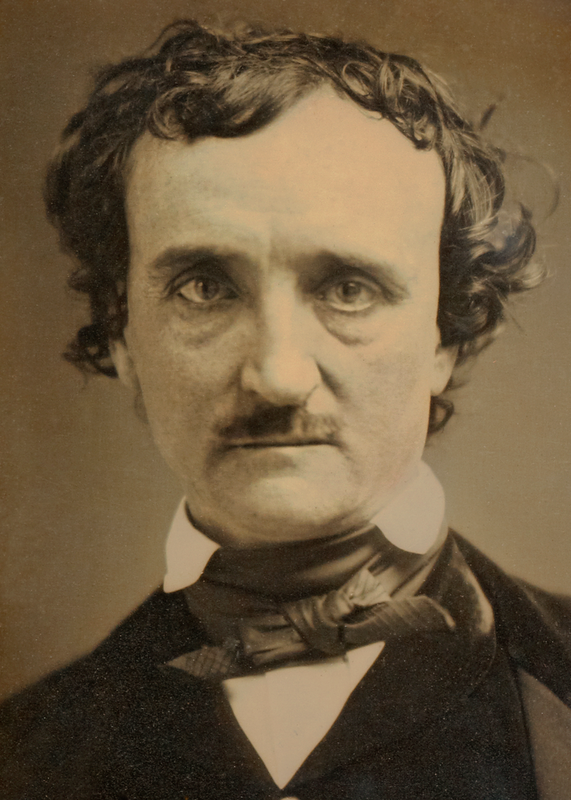 Now Edgar Allan Poe was not considered a really positive person based on his personal life including his military career including being purposely court-martialed at West Point, his marriage and his caustic literary reviews and writing on many macabre topics. At least he was positive about ale! 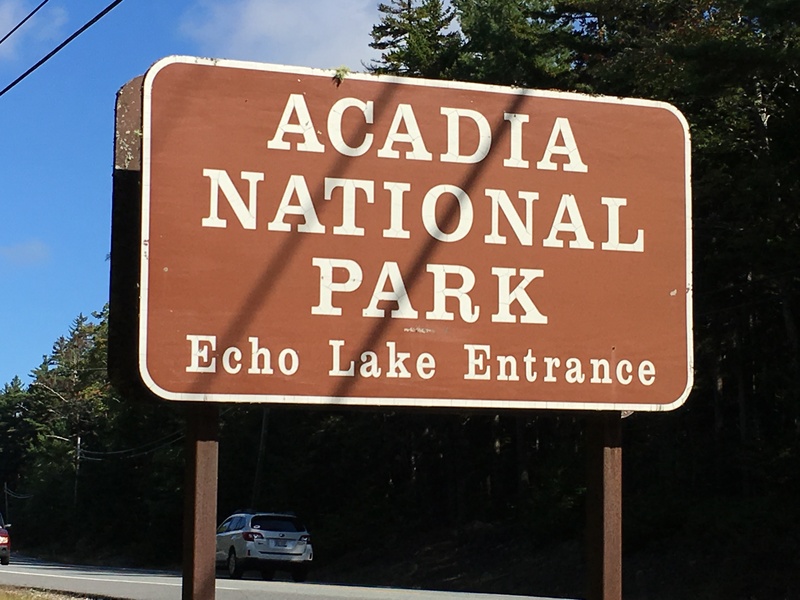 After three-days in New York City and then a short two-day stay in rural Bridgton, Maine, we spent three days exploring Acadia National Park. 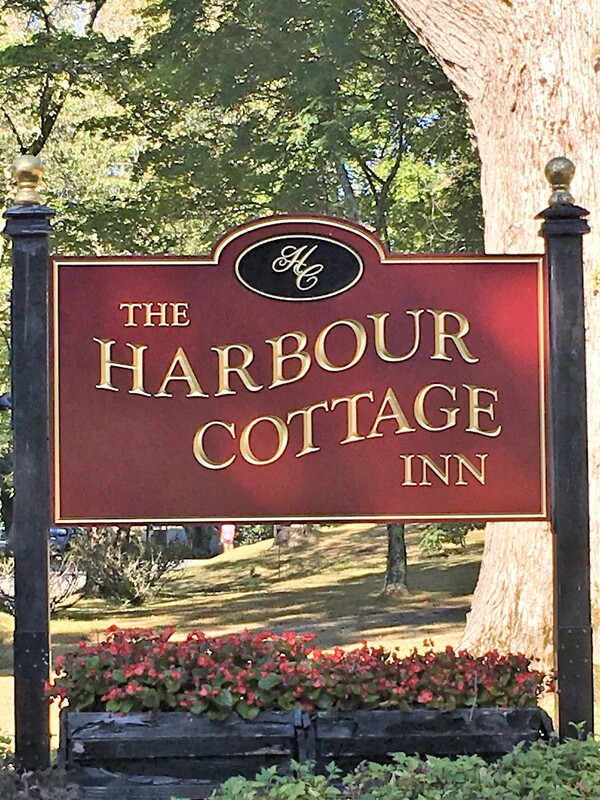 We stayed in Sourthwest Harbor – population 1,778 – a little village about fourteen miles from Bar Harbor – population 5,394 – a larger burg, but the former has far fewer people and is not a docking point for cruise ships and SW Harbor still offers some nice amenities and great access to the Park. 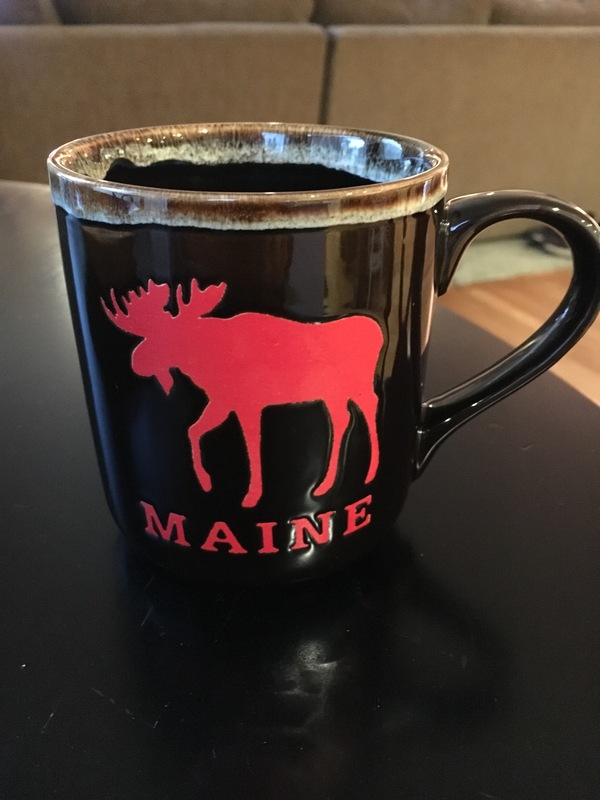 Before the narrative below on sights and breweries/bars we visited in Maine, let’s talk ubiquity (*1) – six categories that are emblematic of “The Pine Tree State” – most of which we repeatedly witnessed on our delightful trip throughout the state. 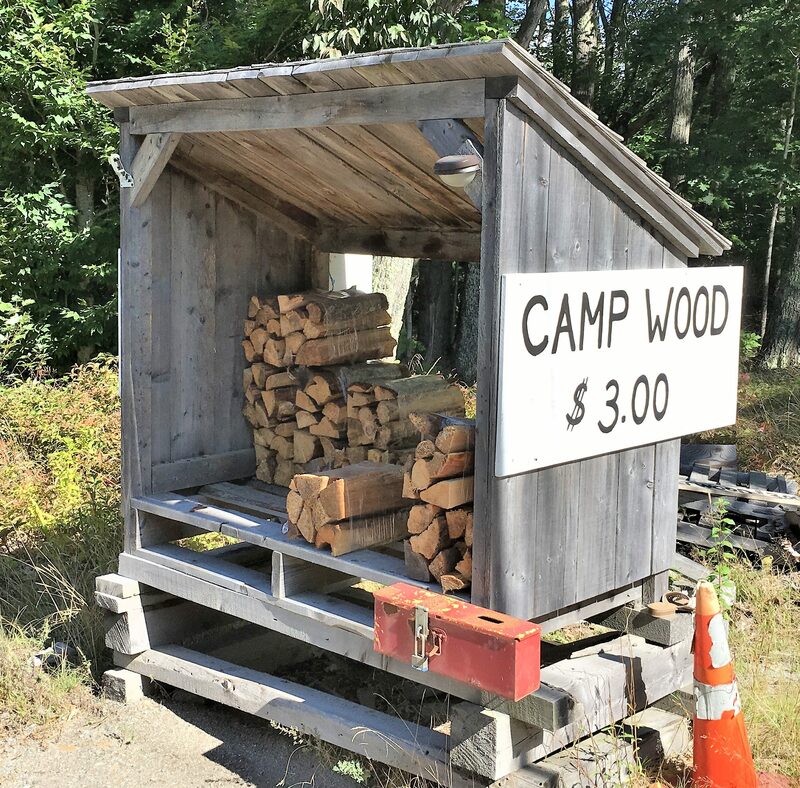 Self-service Wood Sales – It seems that most rural residents make some extra income by selling bundles of firewood to campers or winter vacationers. These little structures dot the road. Most are $3 (on the honor system) and we got a kick out of the sales pitch of one: “Organic Wood.” We didn’t check to see how that was certified. 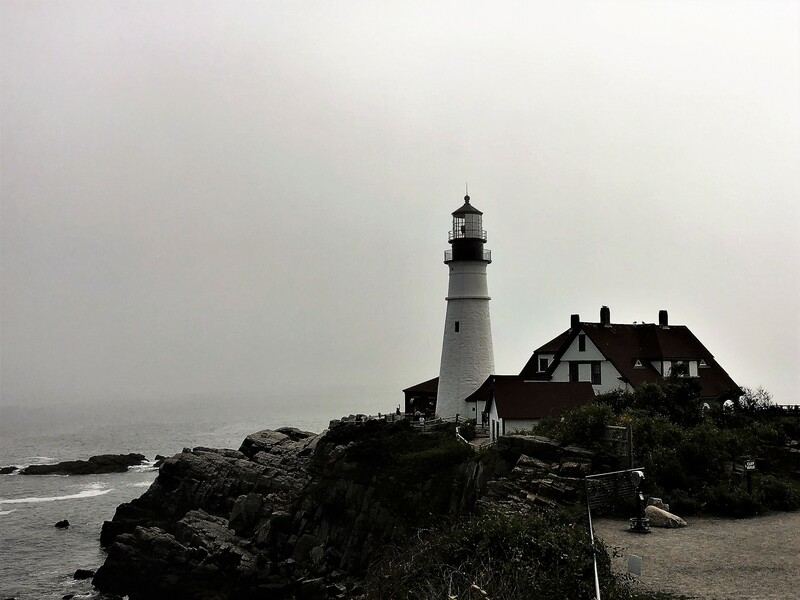 Lighthouses – While Michigan has the most, Maine has over sixty and we saw three beautiful structures close-up including Bass Harbor Head Lighthouse, the Rockland Breakwater Lighthouse and the Portland Head Light. 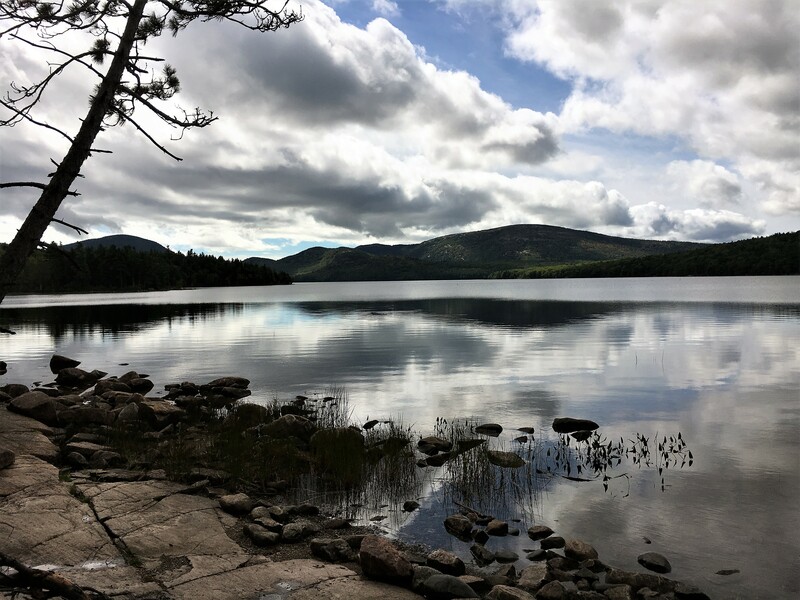 Lakes – There are apparently 6,000 water bodies in Maine greater than an acre in size and approximately 2,200 of these are named lakes. (“Science Answers”). 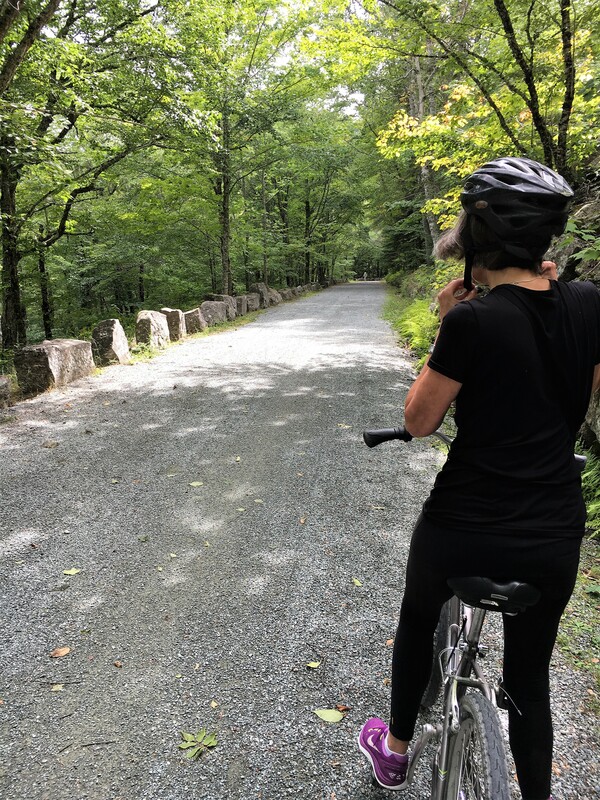 We rode the 6.1 miles around Eagle Lake on one of the Carriage Roads. 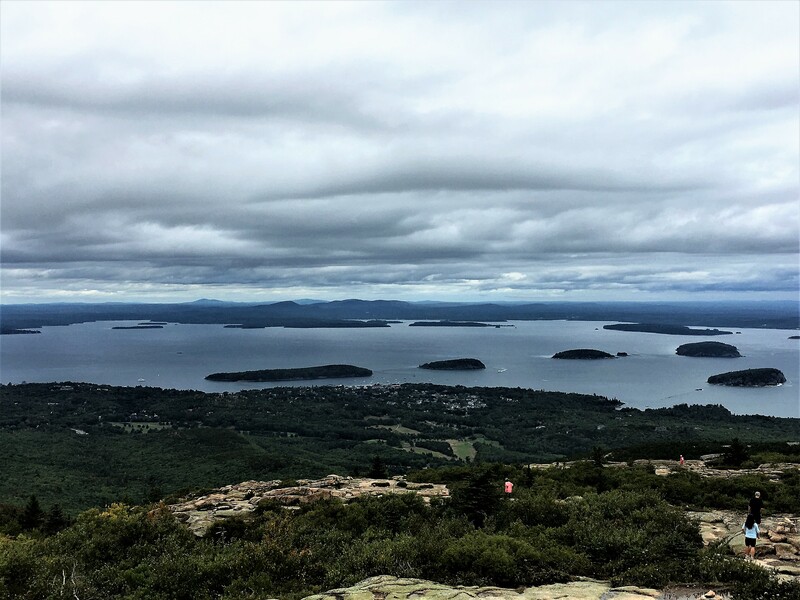 There are fifty-seven miles of Carriage Roads that weave through Acadia National Park and are open to hikers, bicyclists and horses. One travels through great scenery with no autos. 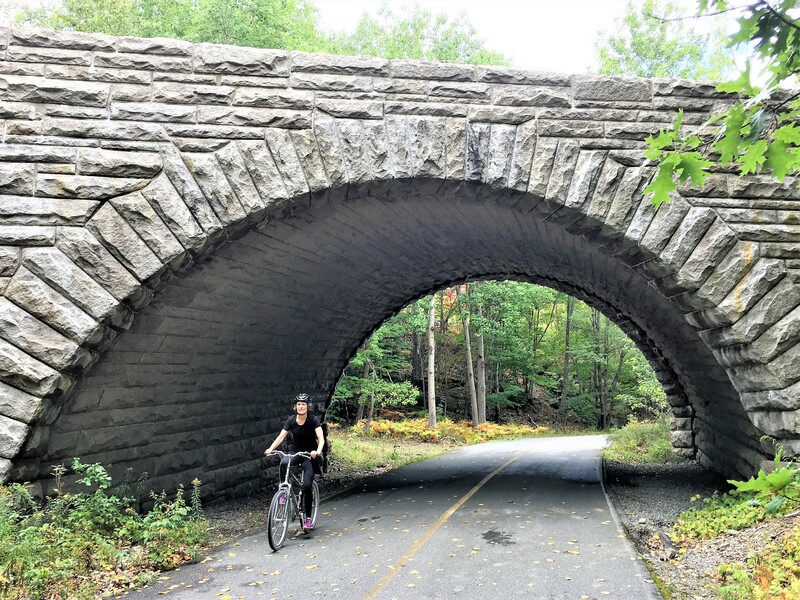 They are a wonderful legacy to John D. Rockefeller who gave millions to build these paths from 1913 to 1940. They also have some beautiful stone bridges along the way. 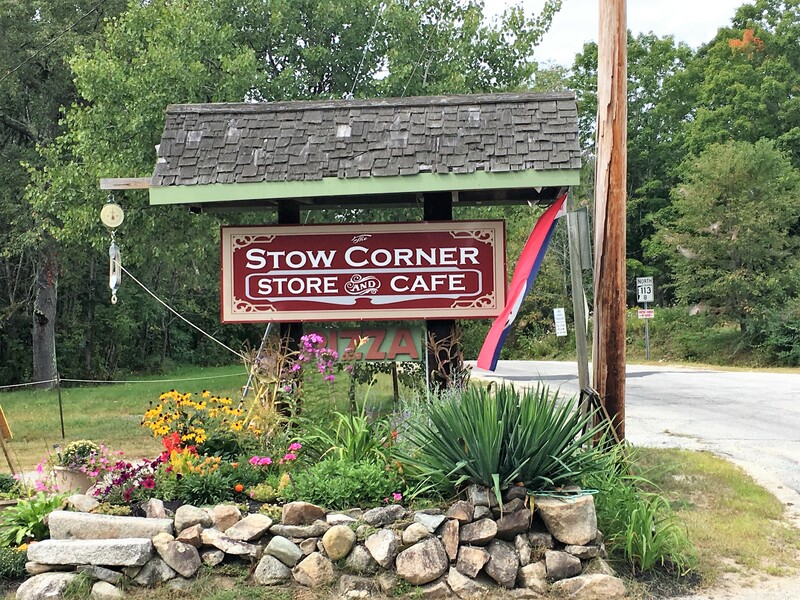 Okay, we weren’t in exactly wild areas, but I was determined to have an “encounter.” So I eventually brought one back to Oregon – now a favorite coffee mug along with my Benedictine Brewery stein……I got the former at the Stow Corner Store in Stow, Maine – population 425. 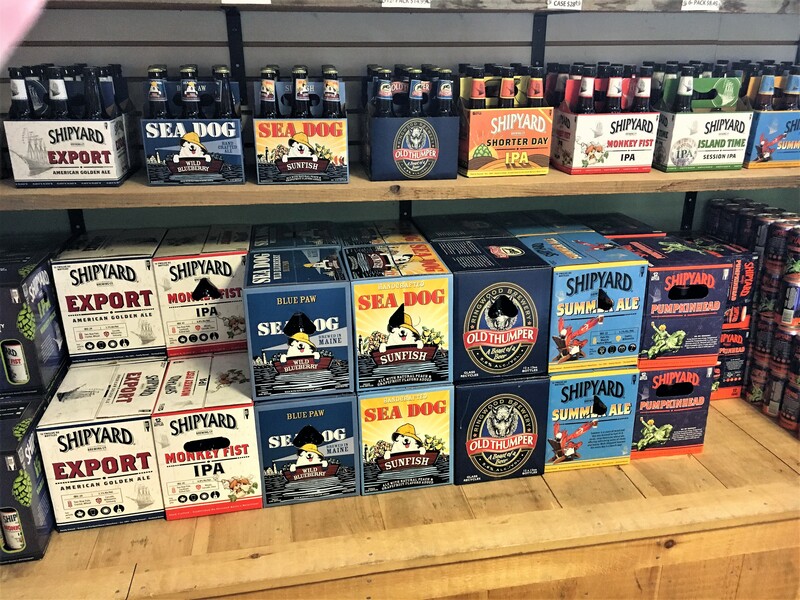 Breweries – While not getting bogged down in a myriad of statistics, suffice to say that the micro-craft industry is thriving in Maine. 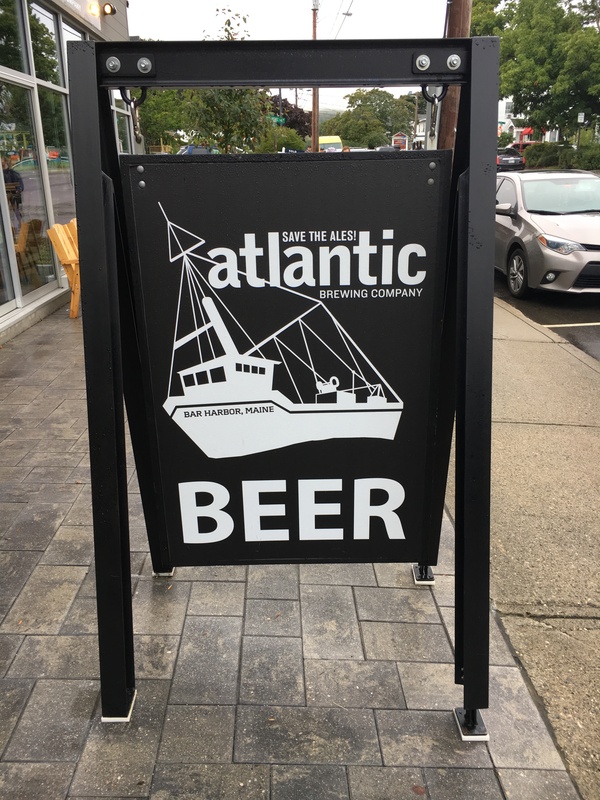 The afternoon, after our Oli’s Trolley tour of the Loop Road, we visited Atlantic Brewing right in downtown Bar Harbor. 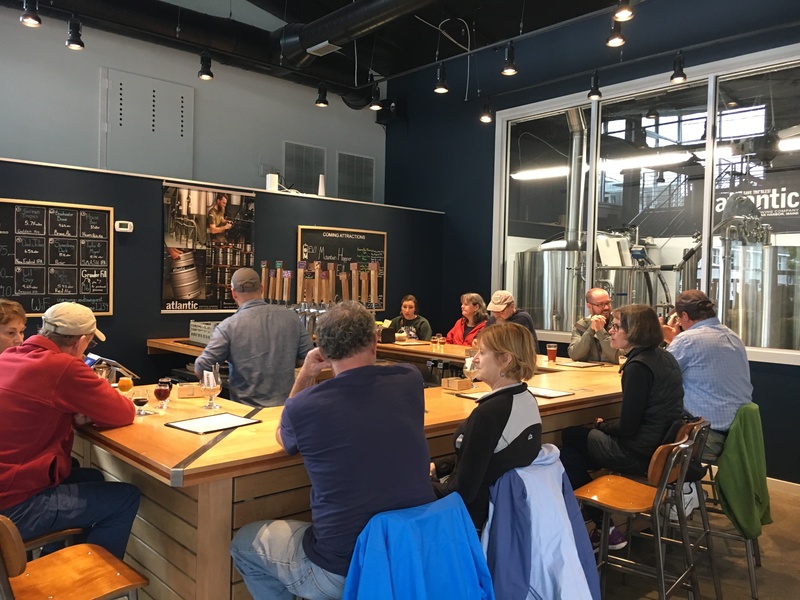 We liked the modern lines of the tasting room and met two nice couples sitting at the bar – from North Carolina and Tennessee – extending their visit until Hurricane Florence had dissipated. The bartender, although he only had worked there for a few months was very knowledgeable about their beer and the brewing process besides being generous in letting us sample their beers. 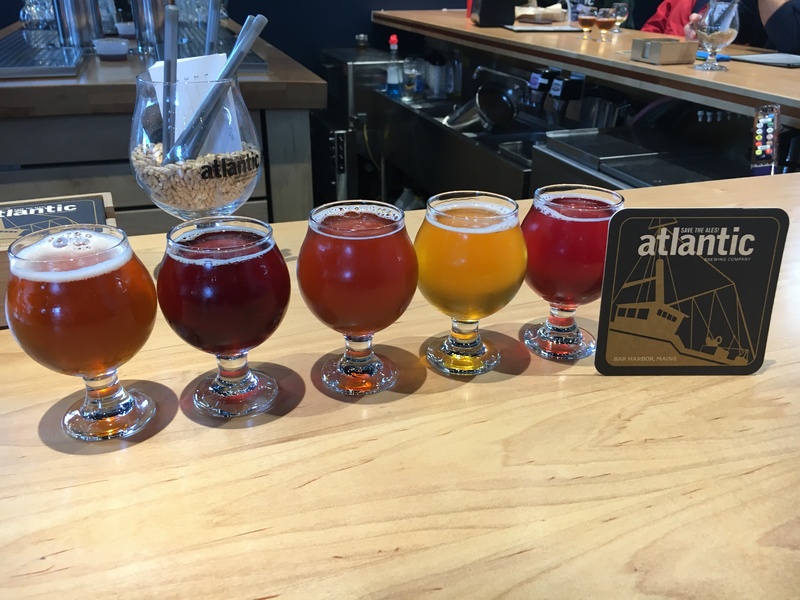 Atlantic – founded as Acadia Brewing in 1990, has expanded twice and now has two locations – the primary brewery is on a ten-acre farm a few minutes from Bar Harbor. 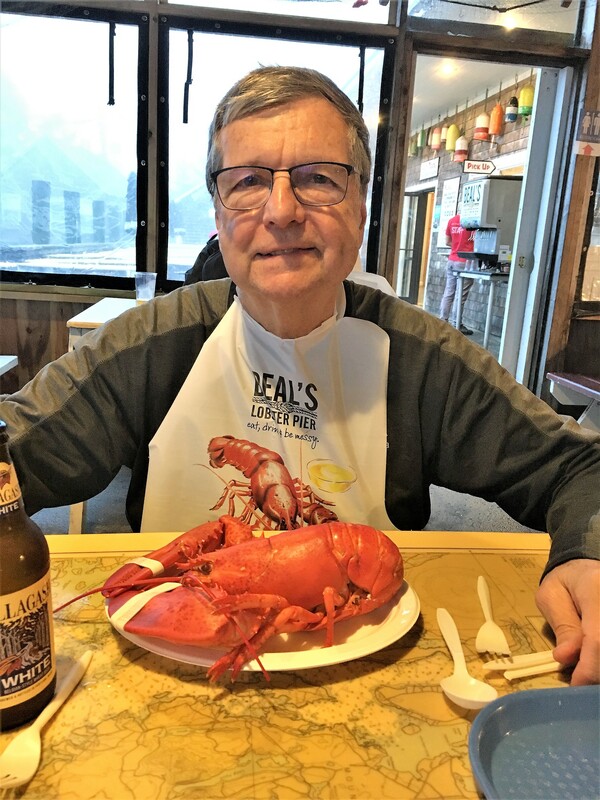 Back in SW Harbor for dinner, I said to Janet that it had been quite a few years since I had tried lobster in Maine – Janet doesn’t like it – so we tried Beal’s Lobster Pier – only a few hundred yards from our bed and breakfast. I tried a formidable, but not the largest lobster, with an Allagash White Ale. My dinner without the beer set us back about $38. Based on the taste and the challenge to eat it, I’m glad I tried it again, but after the two experiences, I will always opt for a steak or other seafood in the future or maybe get lobster roll instead of doing all the work myself. 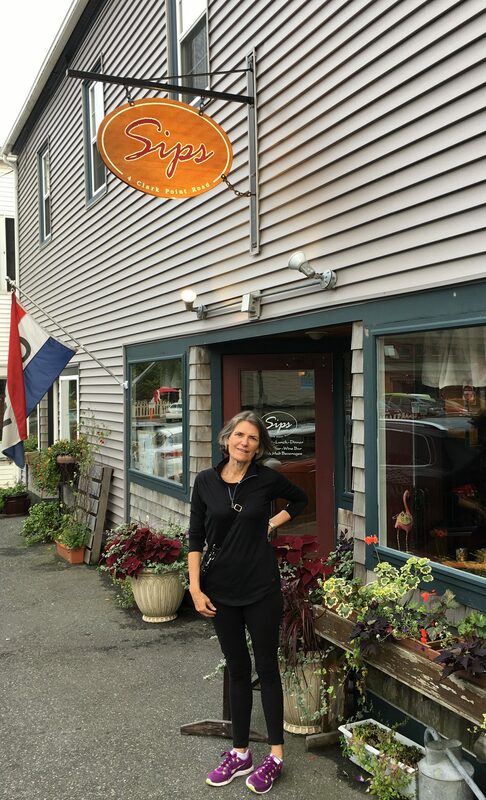 I might add that I did not have guilt over the fate of the lobster although if I had known about Bale’s competitor down the street as featured in a Maine Press report after we returned, we might have gone to Charlotte’s Legendary Lobster Pound. 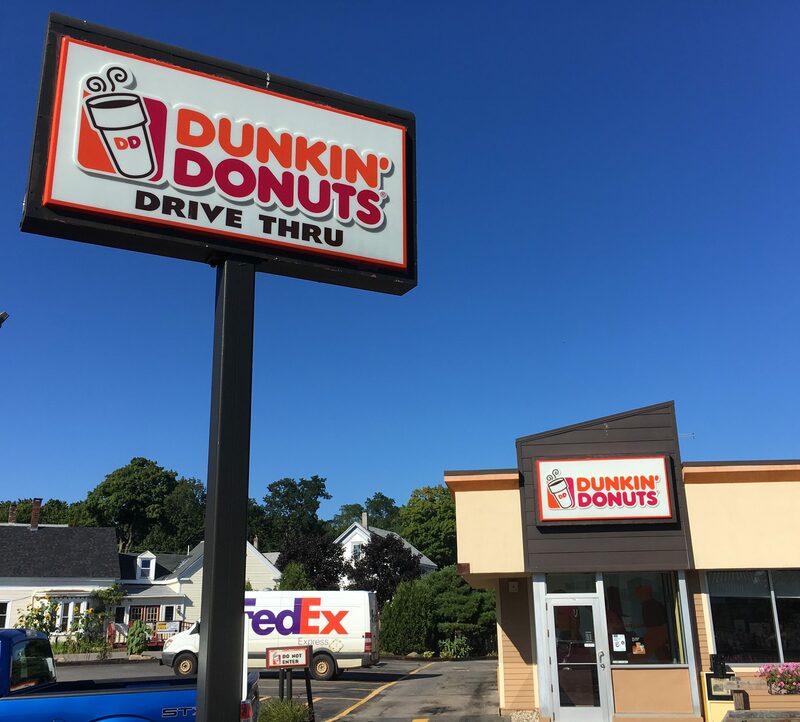 “Charlotte Gill (owner) ….. told the Portland (Maine) Press Herald that she had been looking for a way to reduce the suffering of her signature menu item. 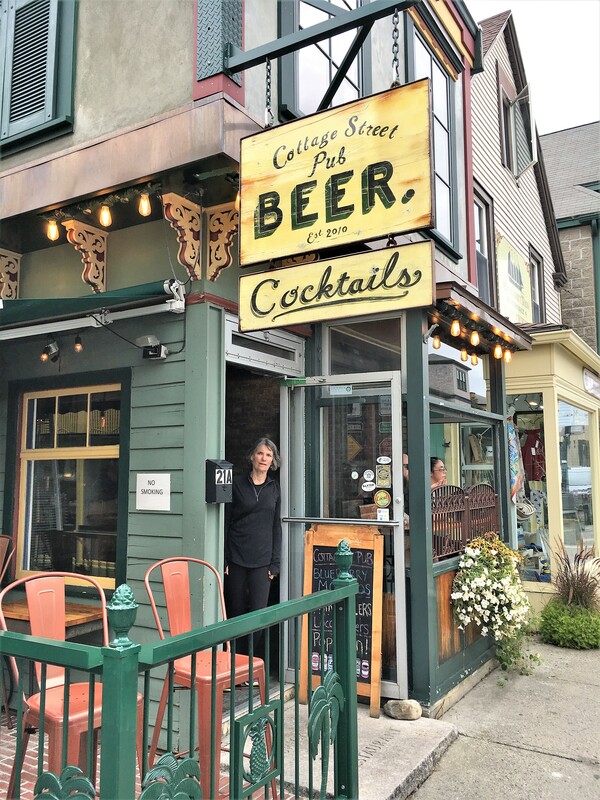 That afternoon, we strolled through “downtown” Bar Harbor and stopped at the quaint Cottage Street Pub. 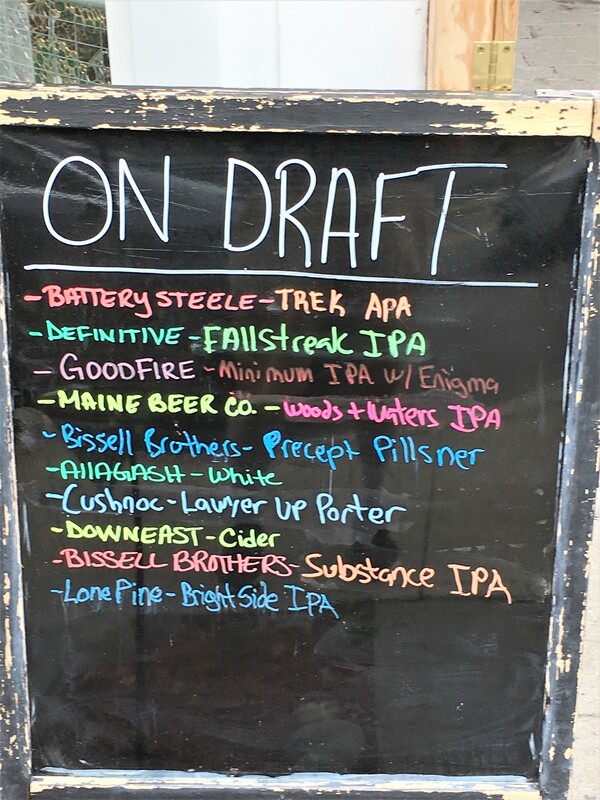 We enjoyed sitting on the patio overlooking one of the main streets and split a Maine Brewery – Woods and Water IPA (6.2%) – appropriately named! They had a number of good Maine beers on tap. 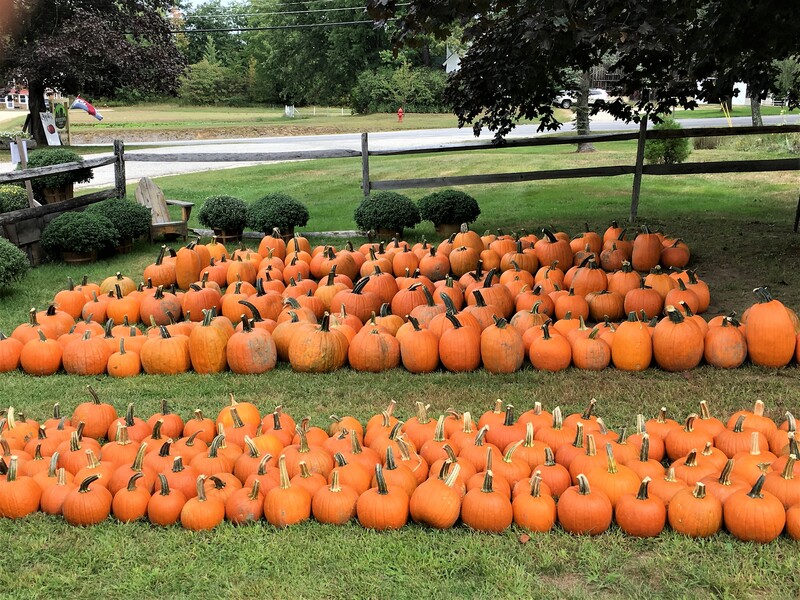 September after Labor Day and before the “foliage peepers” who invade New England from late September through most of October is the best time to visit Maine. 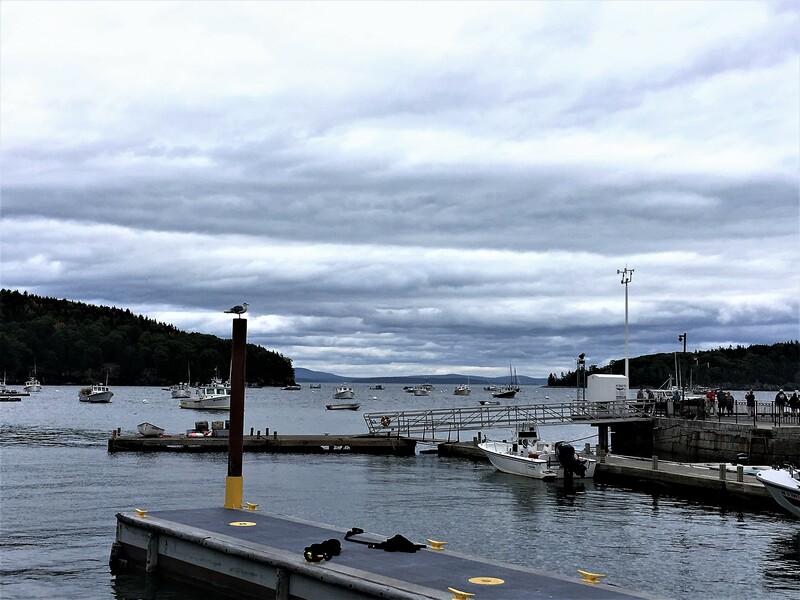 While Bar Harbor was still bustling, the crowds there and in the park were not bad. Sitting on the patio overlooking one of the main streets was a treat. 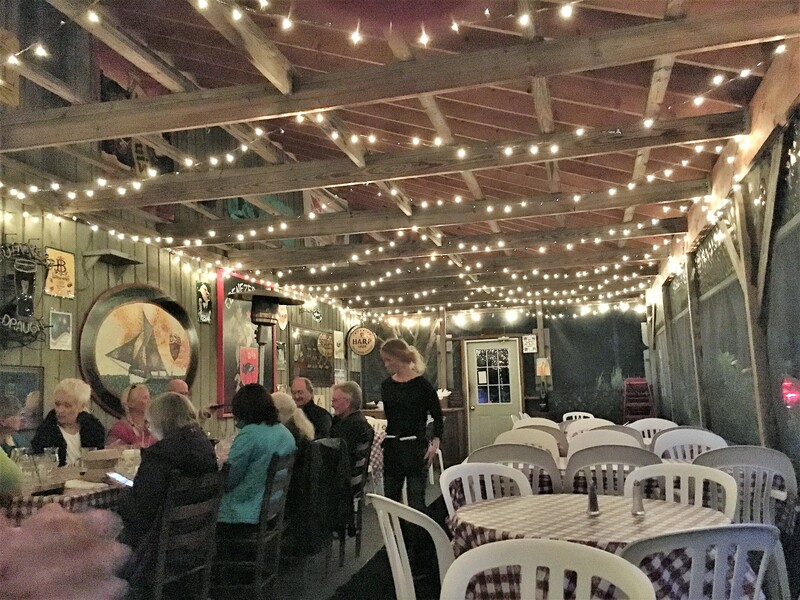 That night we ate dinner at the bar of one of our favorite restaurants on the trip – Sips in Southwest Harbor. While Janet had an excellent pasta dish, I decided after my ill-fated encounter with the crustacean the night before, to have a hanger steak – a good choice. 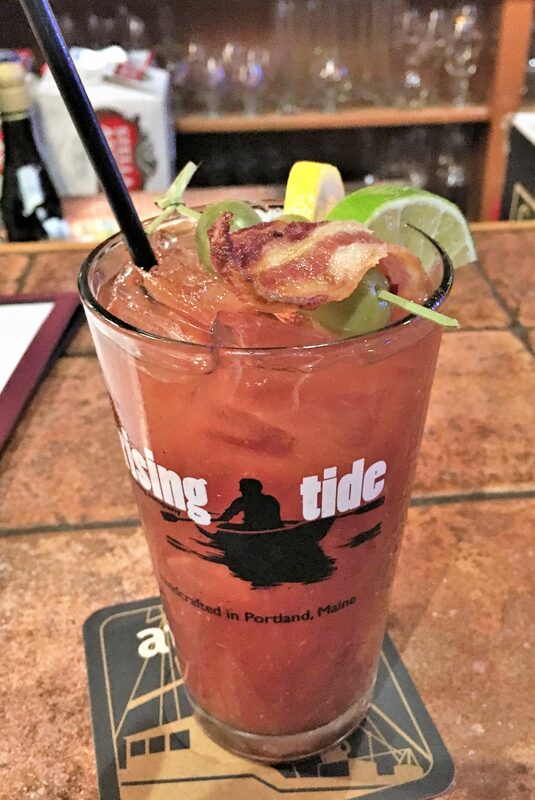 However, the highlight for me was a Happy Hour Bloody Mary. For $5 I relished the best looking cocktail, I’ve had in a long time. Multiple olives, lemon, lime and bacon! 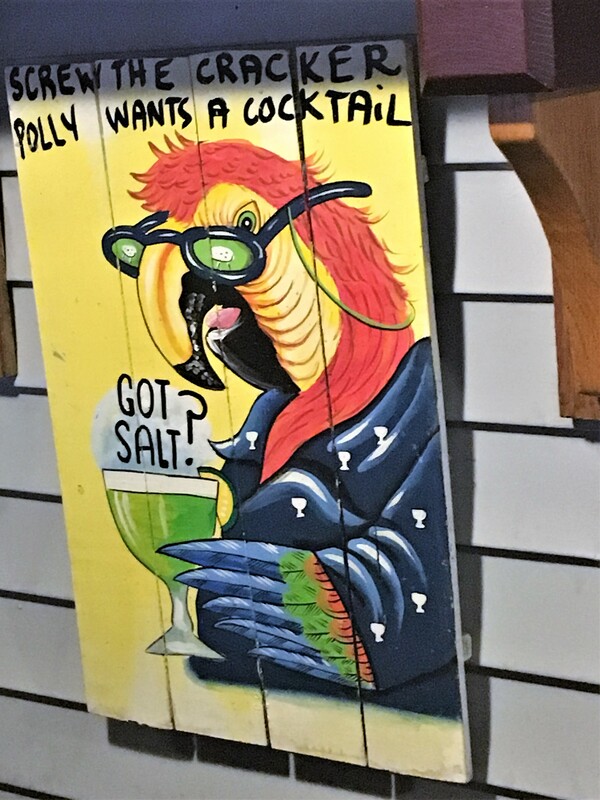 For a nightcap, we hit the Island Bar, a cubbyhole down the street with some great signs and some cordial regulars. 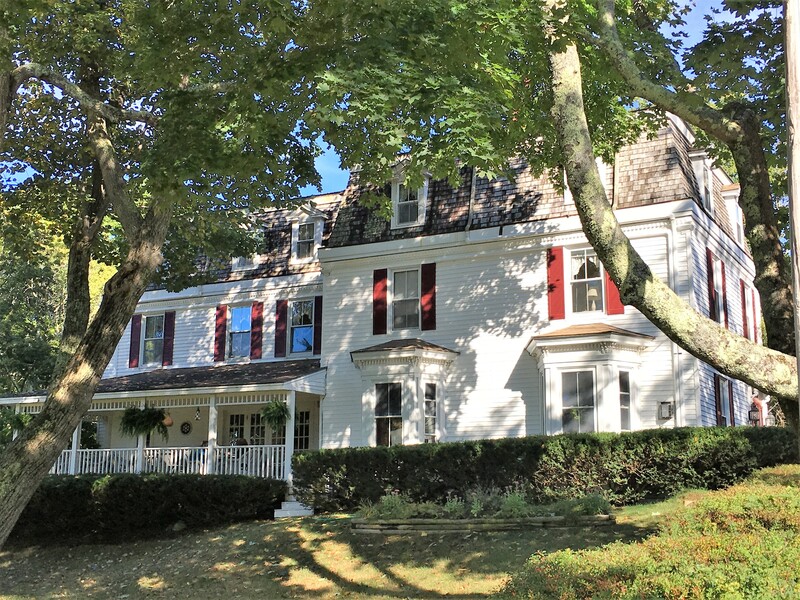 It had one side open to the street with a portable heater supplying the warmth. The view is outstanding and there is a walkway that provides vistas in every direction of the Park. We made a quick trip to another pristine lake – Echo Lake, just before leaving the park . 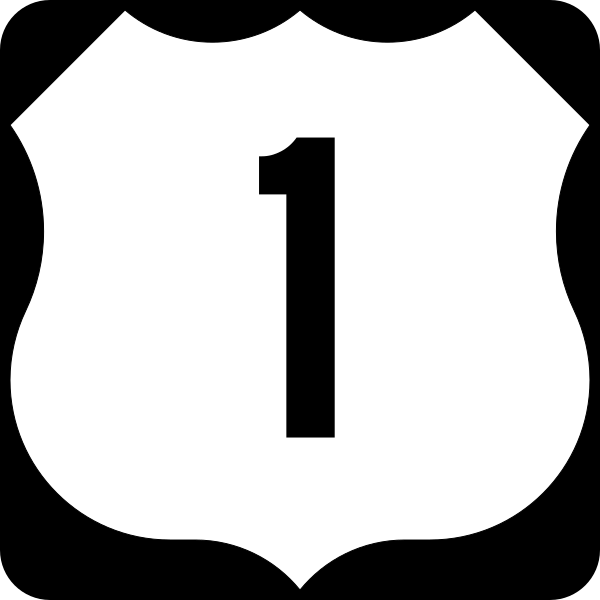 We then were on our way down the Maine coast- south on US Highway 1 – the Coastal Route through Camden and to our next destination Rockland, Maine. As an aside, a wonderful resource we used to help plan our trip both in Acadia National Park and in Portland Maine afterwards is the blog National Parks USA – A Tour of Public Lands and National Parks with T.
Theresa, the author, gives useful tips, historical background and has stunning photos on many of the National Parks and Monuments and related public lands – treasures we should not take for granted. You should check out her blog! My intention is for this blog to serve as a resource for people with the same passion for the parks as me by tagging the units I review by state and including any off-the-beaten-path recommendations I have to offer. At the very least, it will serve as a travelogue, a remembrance of where I’ve been and a reminder of where I still need to go. 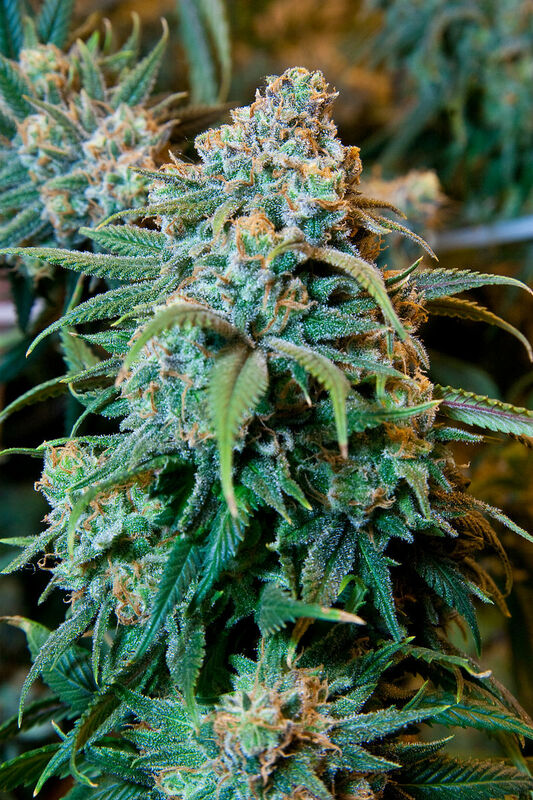 (*1) The use of the word “ubiquity” is meant as a tribute to both my SAE fraternity brother and college roommate, Craig “The Dude” Hanneman – Beerchaser-of-the-Quarter in August, 2012 and Kirby Neuman-Rea, News Editor of the Hood River News. 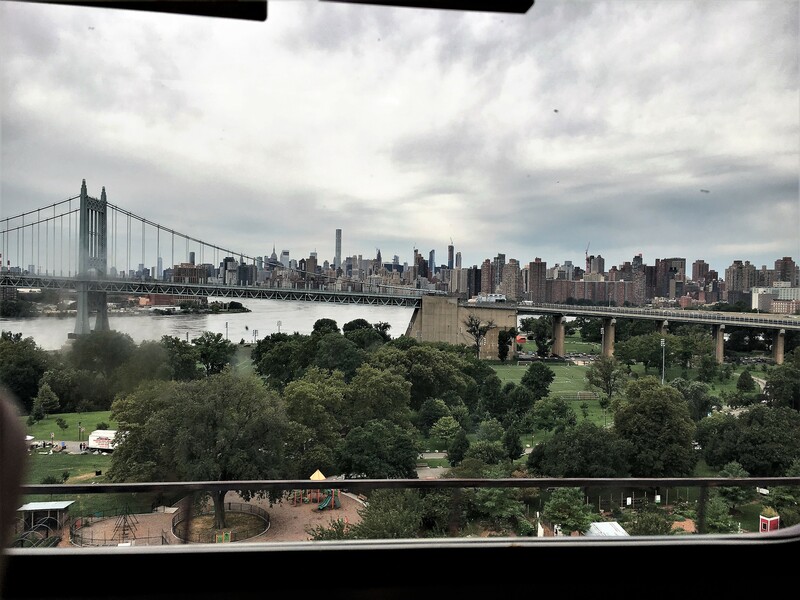 We started our ten-day trip to the East Coast with three-days in New York City. 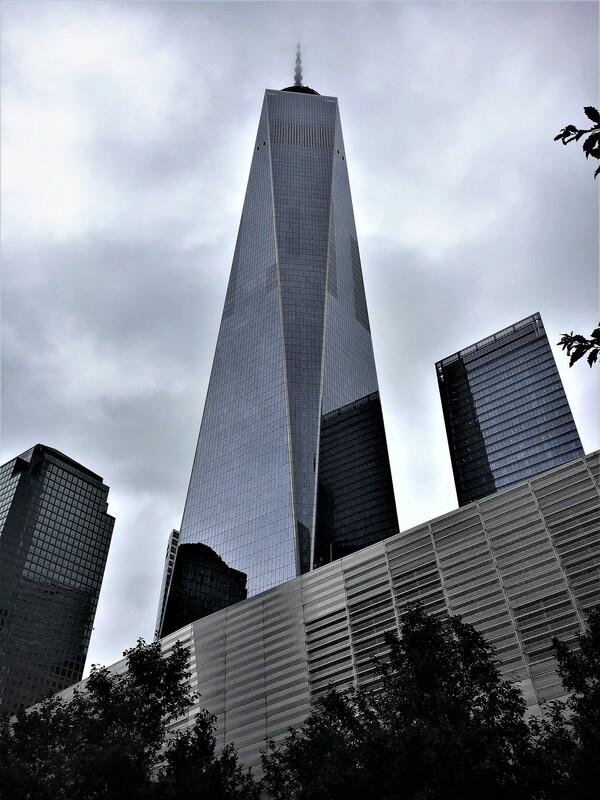 (See the last post of Thebeerchaser for the initial glimpse of our time in NYC). The last of three and one-half in the City was filled. 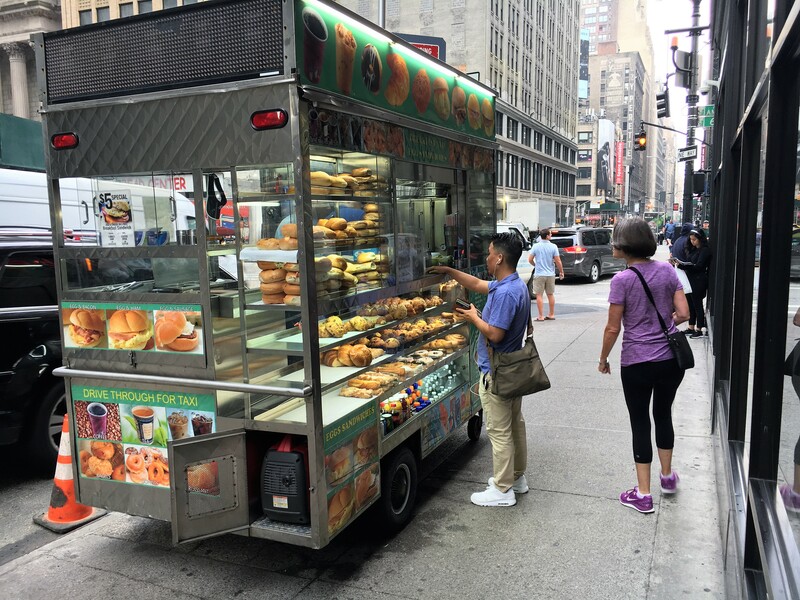 After starting with an excellent Apple Fritter at one of the many street carts, we boarded the subway for the ride to the 911 Memorial and Museum. 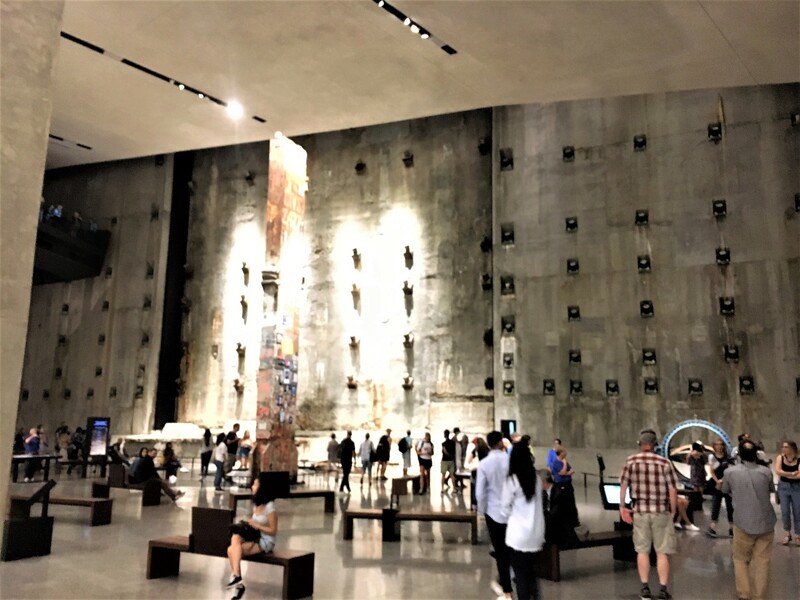 Words are not adequate to describe the emotions one experiences when walking through the museum after entering through the magnificent rebuilt One World Trade Center. 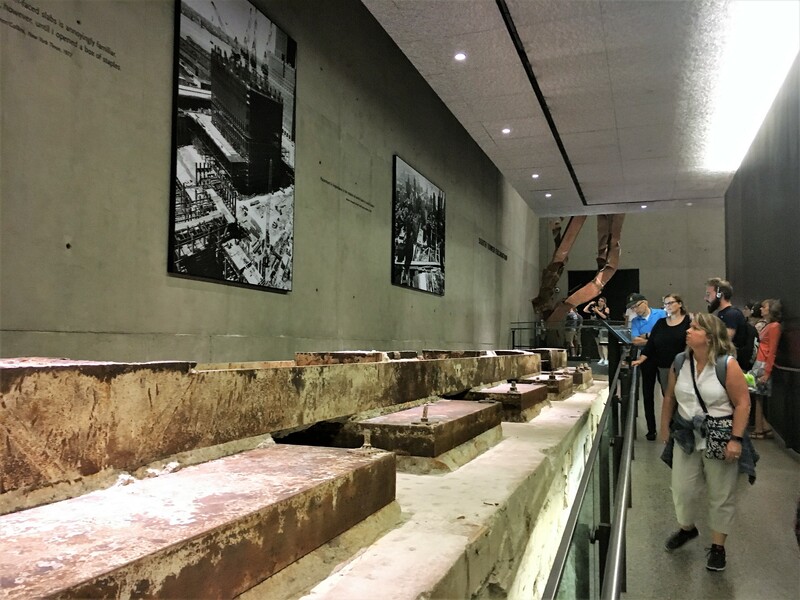 I remember that morning listening to NBC News seventeen years ago as I was getting ready for work, but to view the pictures and videos, hear the 911 calls, see material such as stationery and calendars pulled from the wreckage and witness the former foundational structure conveys new meaning. 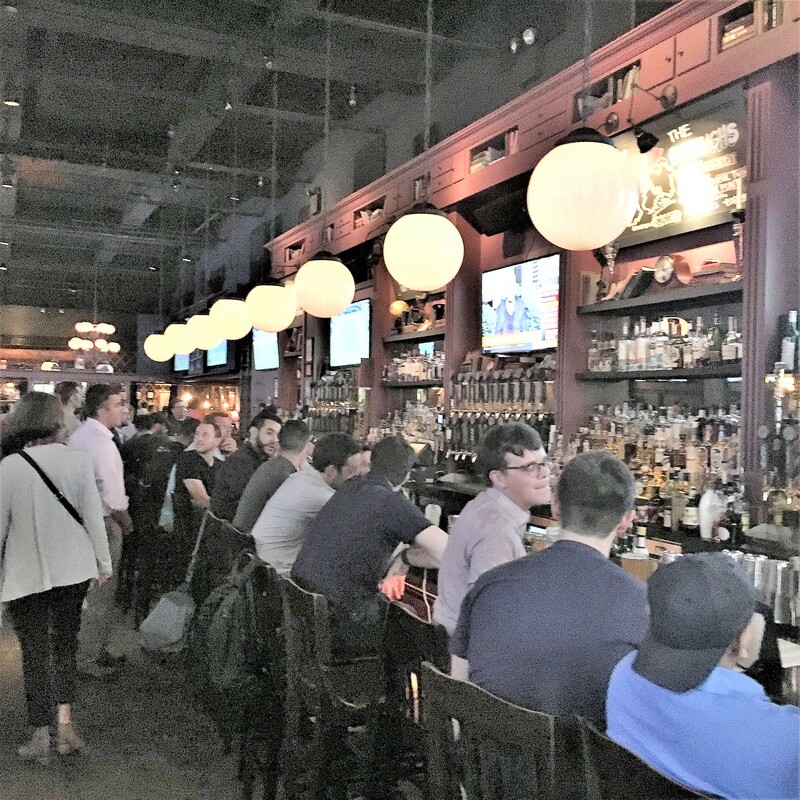 That afternoon, we walked around Midtown and before our Broadway play that Friday evening, stopped and had a pint at the excellent District Tap House – it’s actually two bars. The smaller rear bar at the back. 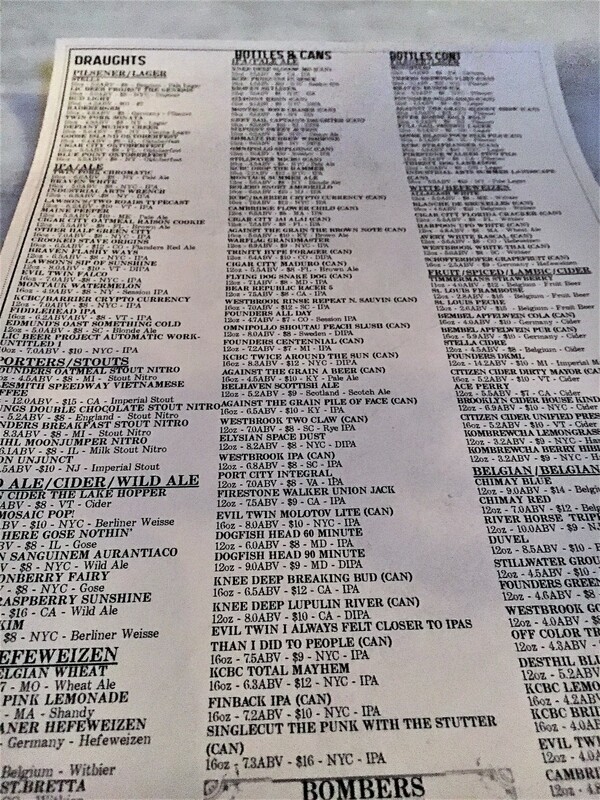 They have an extensive tap list with over fifty beers. Given our initial encounter at our hotel the day before, we split another Brooklyn Brewing Defender IPA. It was a friendly place with a Friday vibe as you can see from this picture of Janet and the “bouncer” at the entrance. 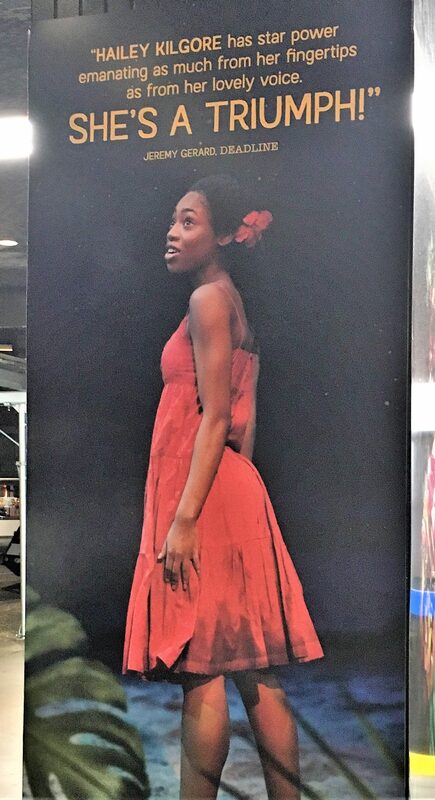 Part of our interest was the lead – a young woman, Haily Kilgore, who attended Clackamas High School in Oregon for two years and was a star in the Portland theater scene before furthering her education in New York and being cast as Ti Moune in this Broadway revival. 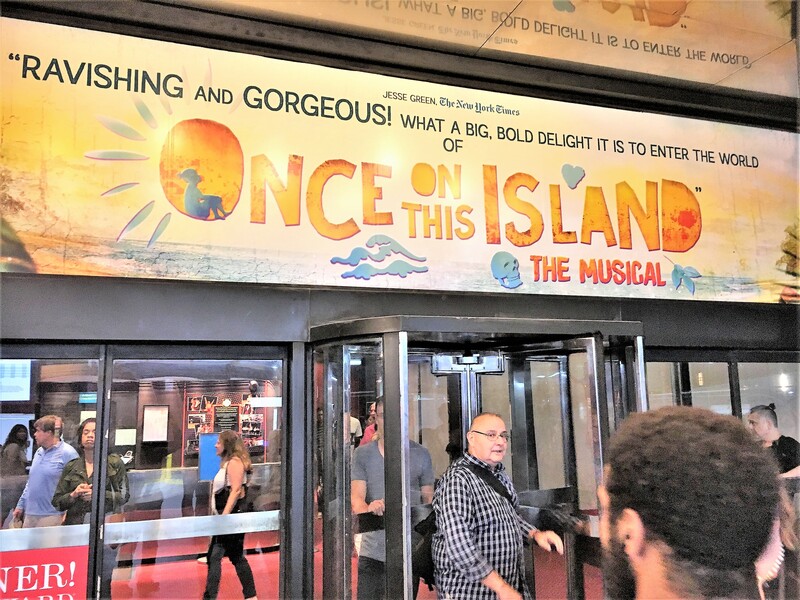 She was nominated for a 2018 Tony Award. On the morning of our fourth day, we took the morning Amtrak to Boston. 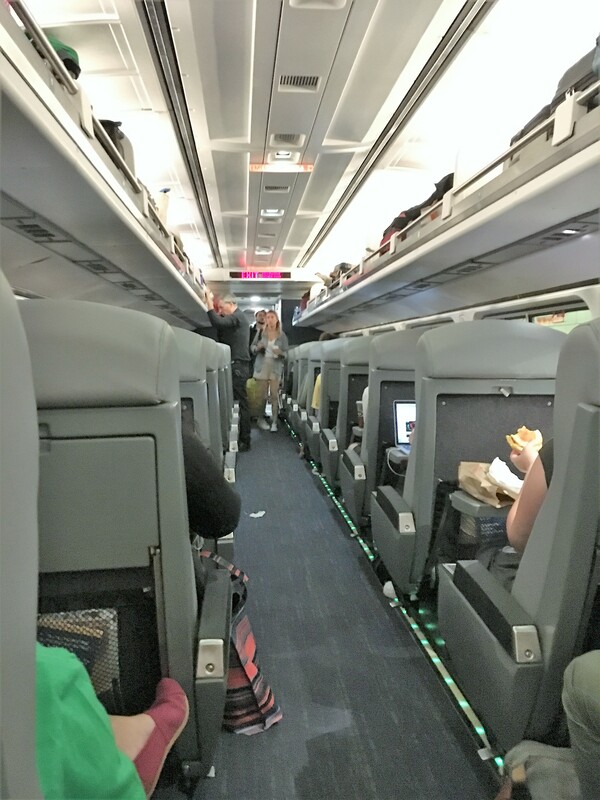 Although we had some great food in the City, my favorite meal was the lox and cream-cheese bagel I ate on my lap in the Penn Station waiting area. The view from the window of our coach as we departed on d the four-hour trip to Boston was outstanding. The coach-bus for the additional hour ride to Portland, Maine and the Amtrak ride were both clean and pleasant. 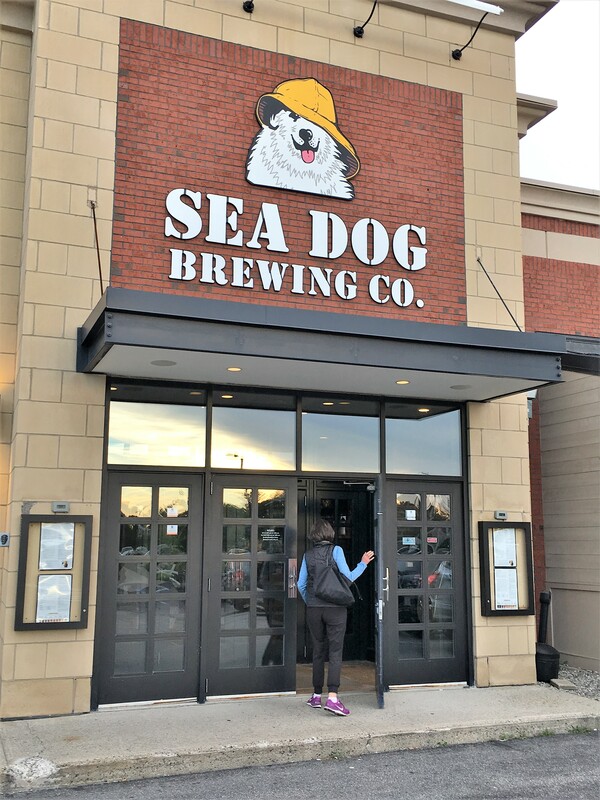 We stayed at a nearby hotel after dinner at the Sea Dog Brewery by the airport – one of nine locations in Maine, New Hampshire and Florida for this brewery founded in 1993. 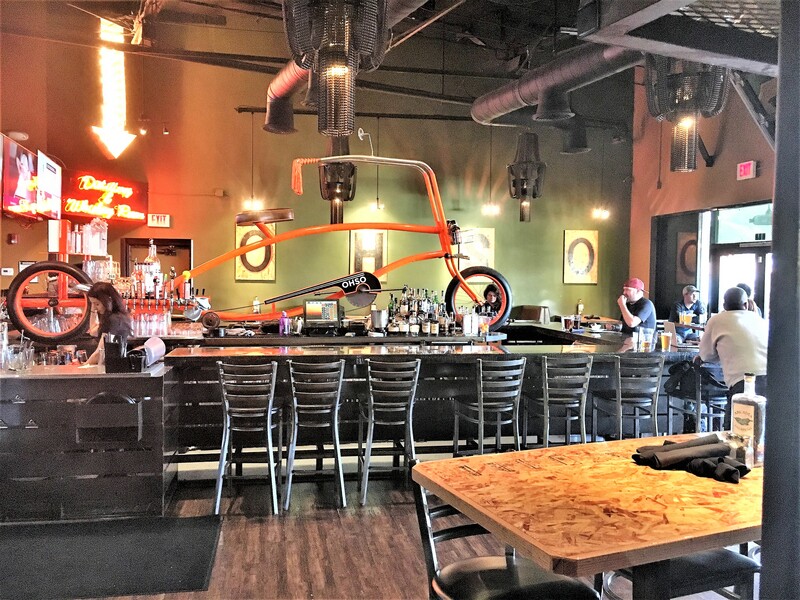 Not much ambiance in this brewpub – kind of reminded me of the Portland (or Denver or Chicago or …..) version of the Rock Bottom Brewery franchise. That said, the staff was courteous and they had sixteen beers on tap. 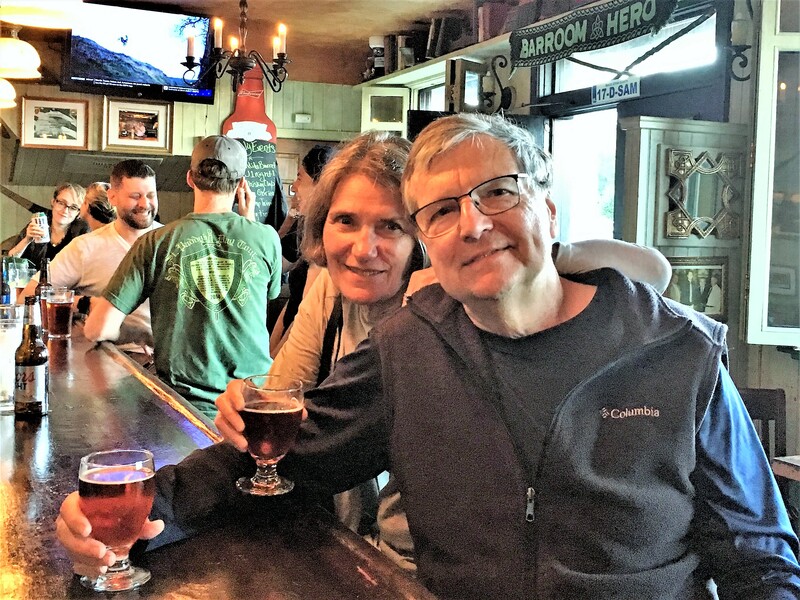 I really enjoyed Sea Dog’s award-winning Windjammer Blonde Ale (4.8%) and Janet’s Deep Stowage IPA (6.14%) a dry-hopped cask ale, which is not itemized on their website, also got a good rating. 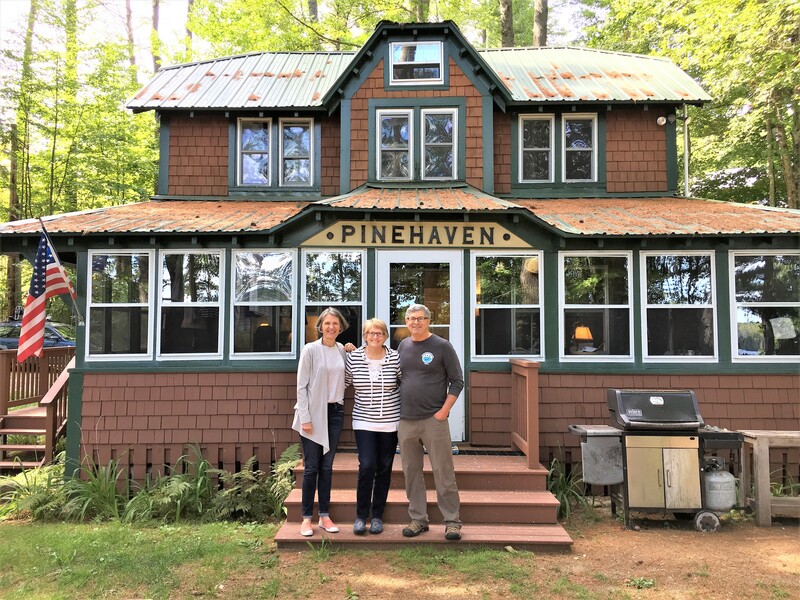 We drove through rural areas about forty miles north to Bridgton, Maine, where our Oregon friends, Roy Lambert and Mary Maxwell – frequent Beerchasers in Oregon, have a picturesque home named “Pinehaven” on one of Maine’s many beautiful lakes. 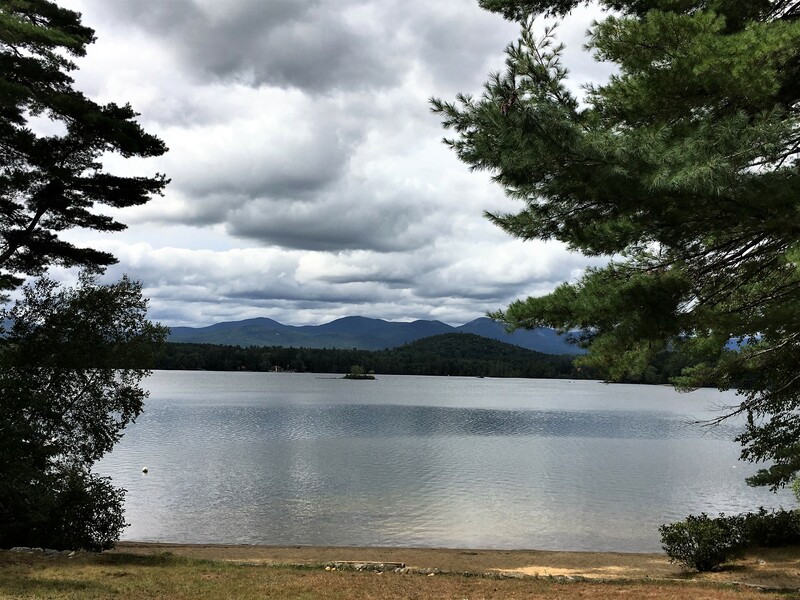 Our two-day stay with them was filled with hikes, kayaking on the lake and hitting some great nearby pubs. 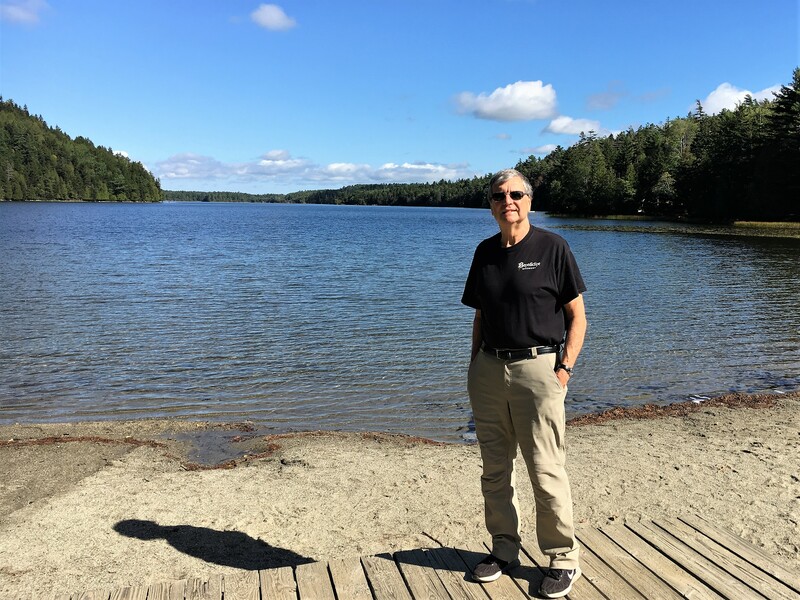 They have both been very active in the Lakes Environmental Association – an important initiative to preserve the pristine nature of this natural resource throughout Maine. 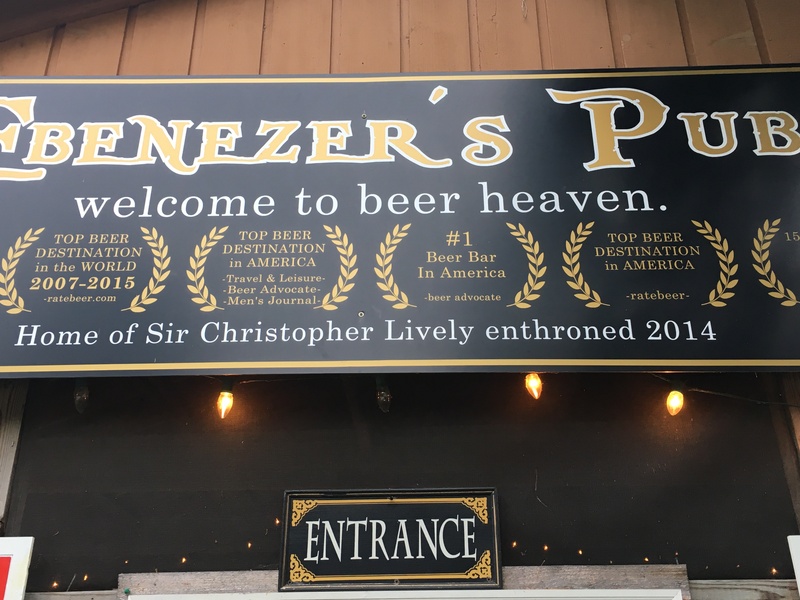 Two of the interesting pubs we visited were Ebenezer’s in the historical town of Lovell, settled during the Revolutionary War and incorporated in 1800. 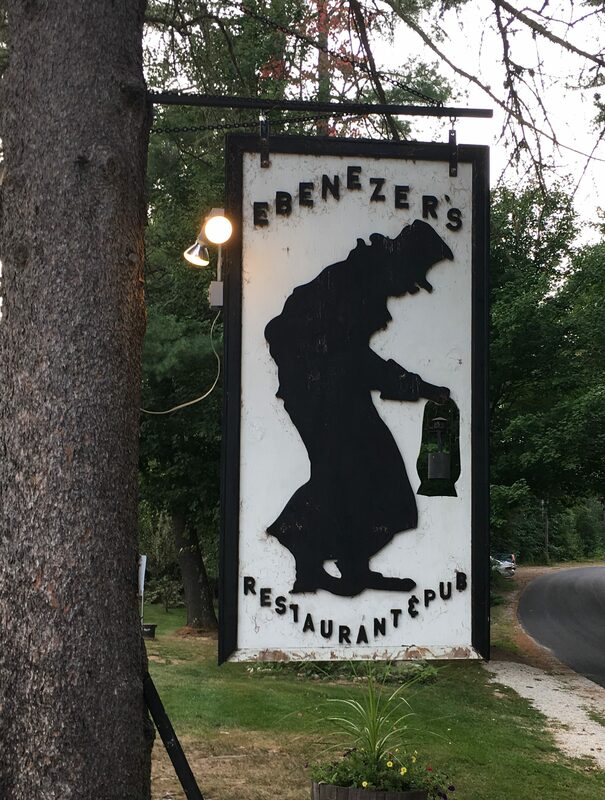 Ebenezer’s adjoins a golf course and is in an old house which includes a wonderful screened porch where we ate and also has a beautiful inside bar. 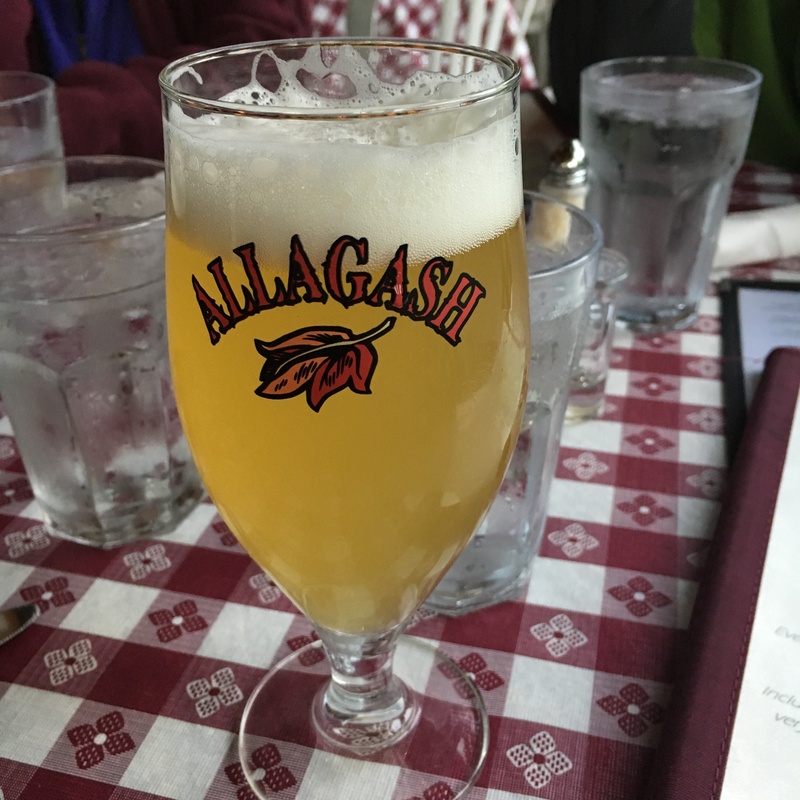 That’s where I had my first of many Alagash White Ales (5.0%) on the trip – one of the most popular beers in Maine. It’s cloudy and white with coriander and orange and was outstanding. Alagash Brewing, founded in Portland, Maine in 1995 now distributes its Belgian-inspired brews to seventeen states. It was definitely one of the best establishments of the many we visited on the trip. 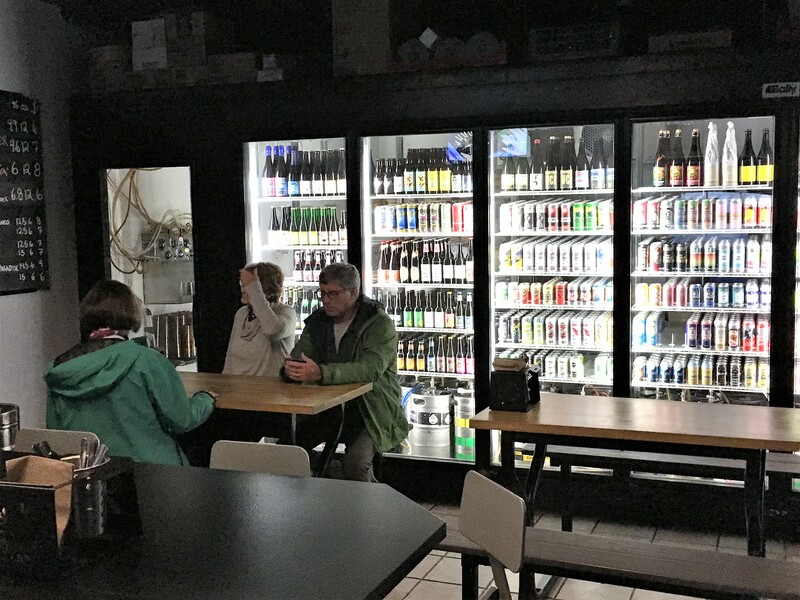 1.5 kinds of beer for every resident…. 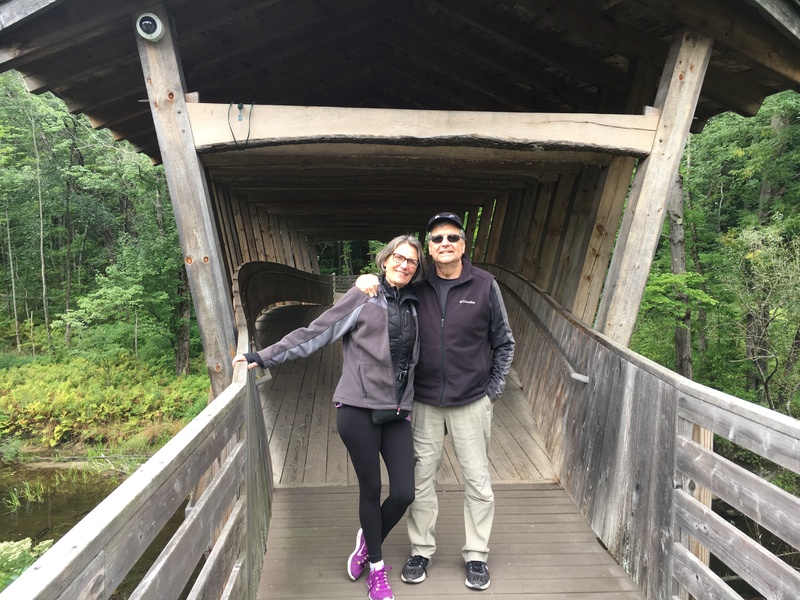 The next day we took a healthy jaunt on a 2.3 mile trail through Pondicherry Park – a 68 acre gem in the heart of downtown Bridgton -population 5,384! 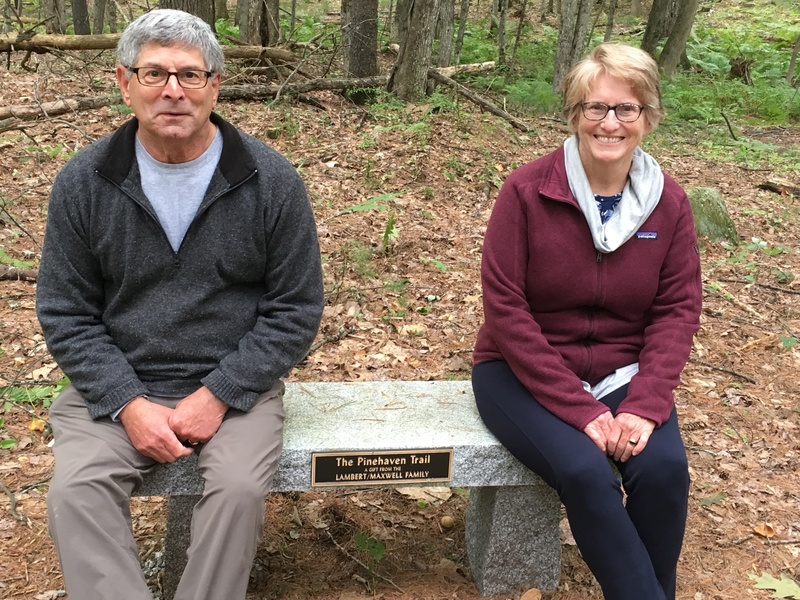 Roy and Mary have contributed time and money to improve and maintain it and there are streams, woodlands and abundant wildlife in this family-oriented park.. 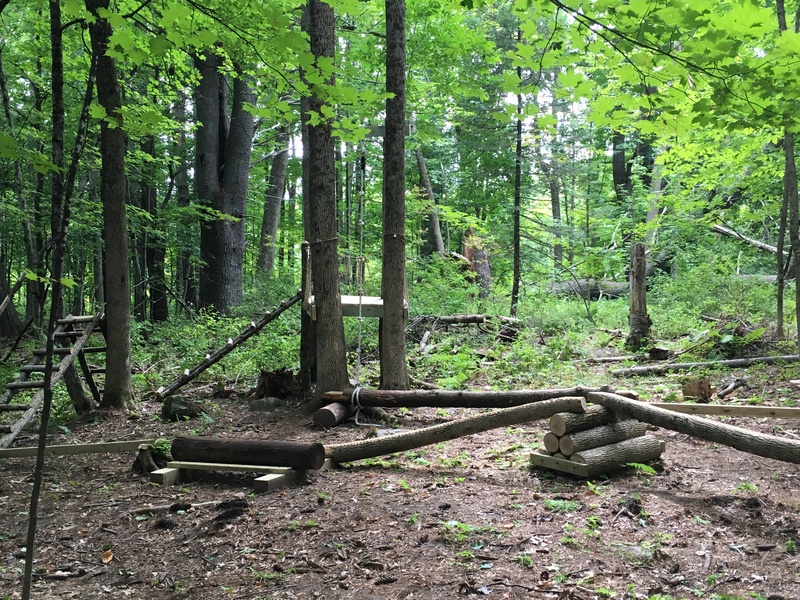 There are a number of small but innovative obstacles courses along the Pinehaven Trail – gifts of the Lambert-Maxwell family. One of the entrances is through a memorial covered bridge. 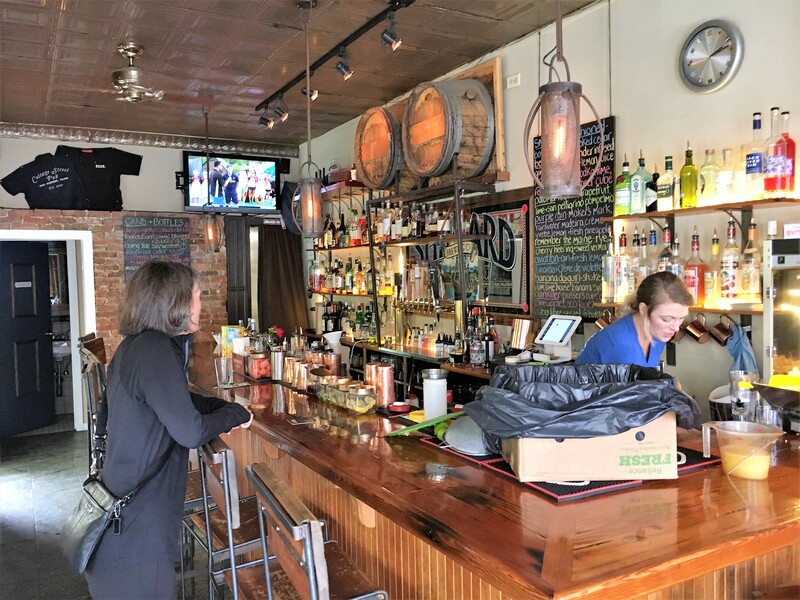 The next day after touring rural Maine, we hit an idiosyncratic but cool pub for dinner – the Standard Gastropub right on Main Street in Bridgton. 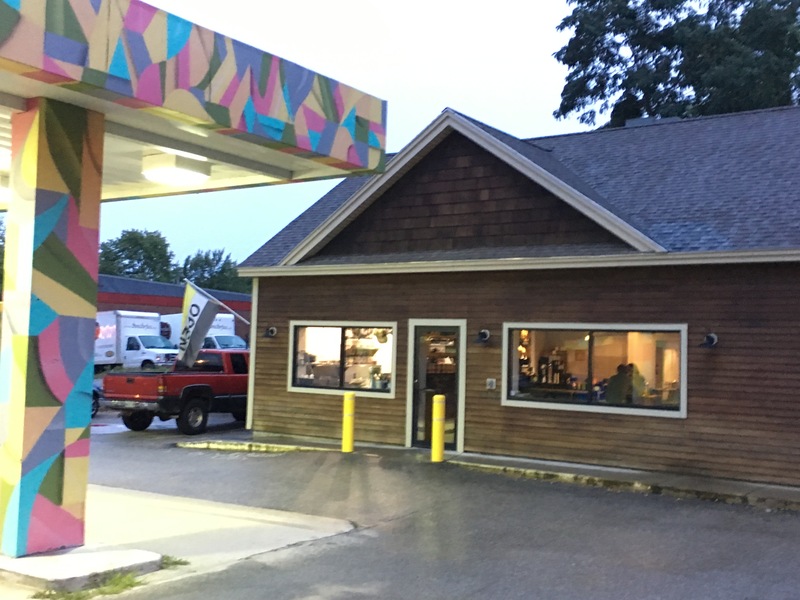 This former gas station and mini-market was converted into a gas station and pub which is know for good comfort food and a large selection of beers – both bottled and on tap. 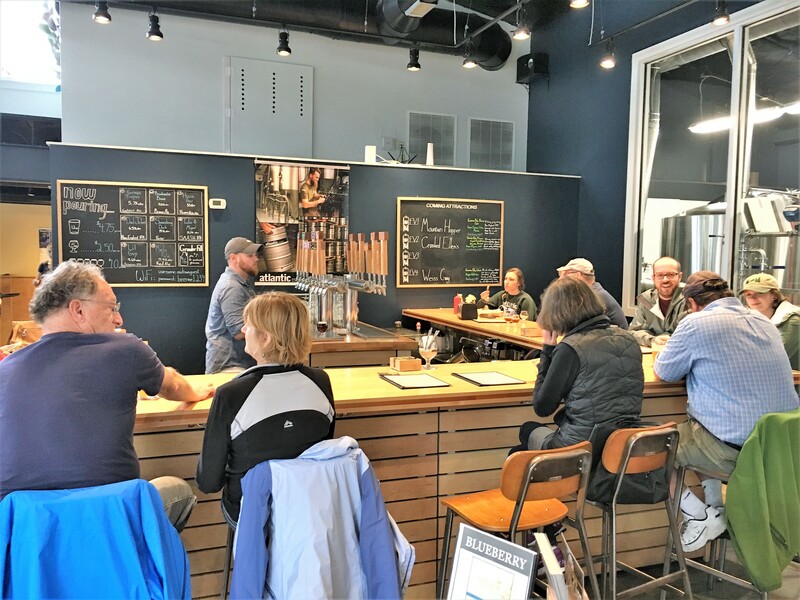 That’s where we first tried the Kresge Kolsch (4.8%) from Cushnoc Brewing in Augusta, Maine and Bissel Brothers’ Brewing of Portland Maine flagship beer – Substance Ale (6.6%). We love trying “local” beers and supporting small breweries – a good choice on both beers that night. 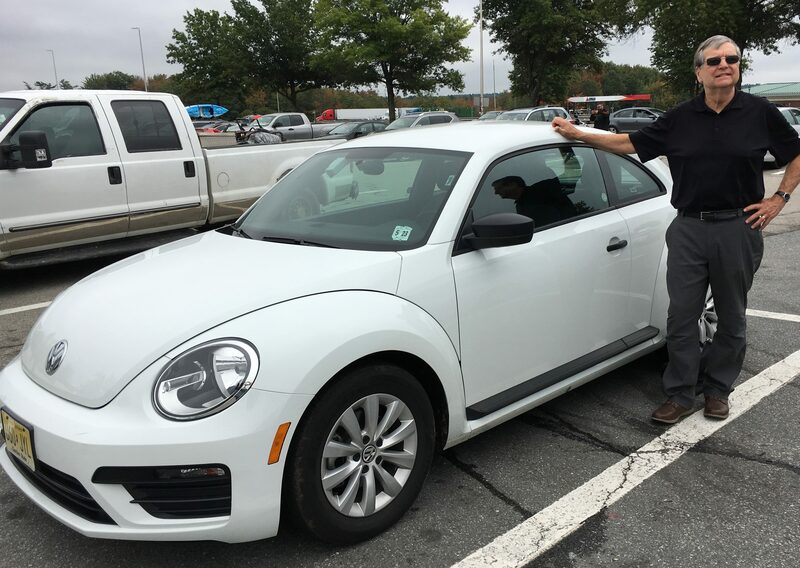 Bissel Brothers was founded in 2013 and has already expanded while Cushnoc was founded in 2017. 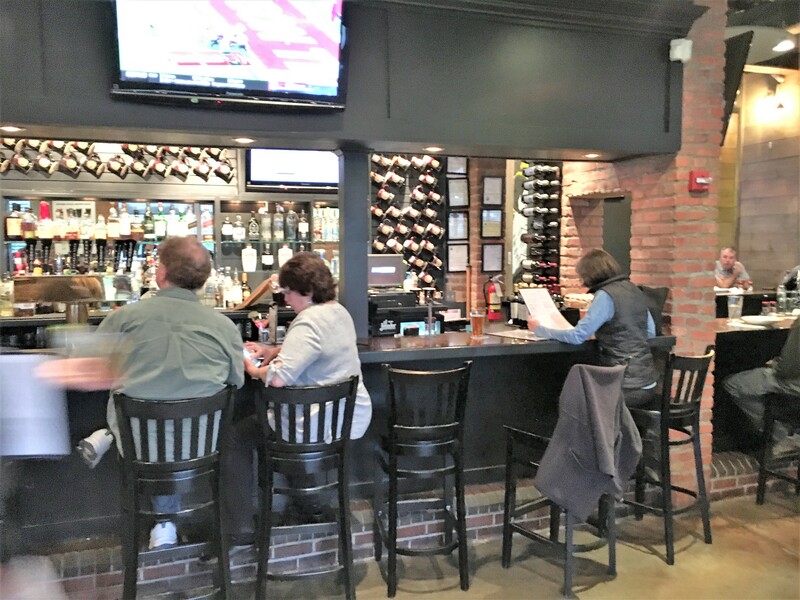 Nothing fancy – but good food and a LOT of beer options! 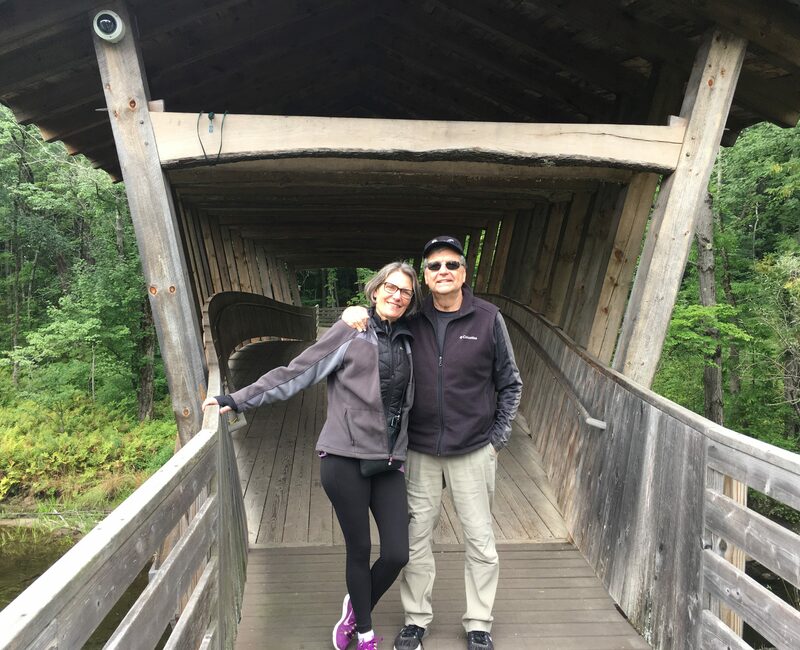 We checked into our quaint bed-and-breakfast – the Harbor Cottage Inn in SW Harbor and took Oli’s Trolley for a 2.5 hour tour of the Acadia Park Loop Road – the best way to get an overview of the park and avoid traffic problems. 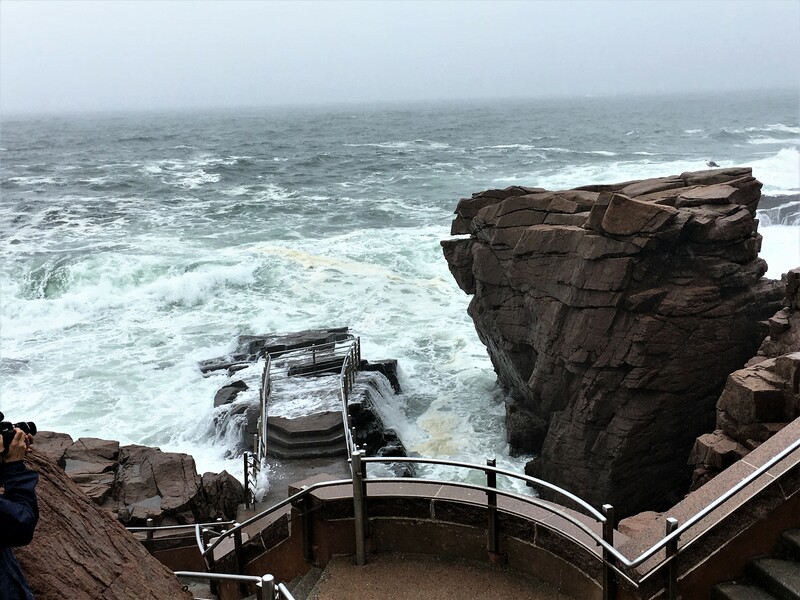 The weather was a bit stormy and windy which made the view along the coastline that much better. 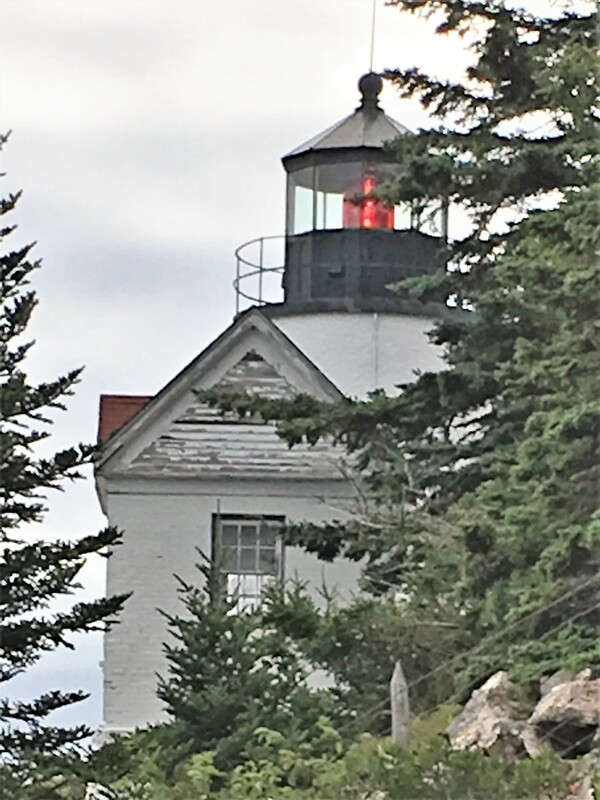 The next post will narrate what we saw in the Park and some of the watering holes in both SW Harbor and Bar Harbor – two wonderful Maine Villages.